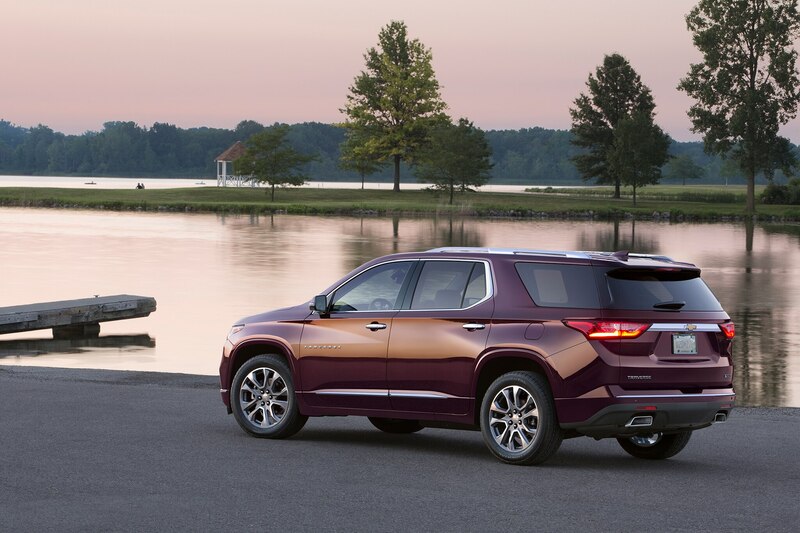 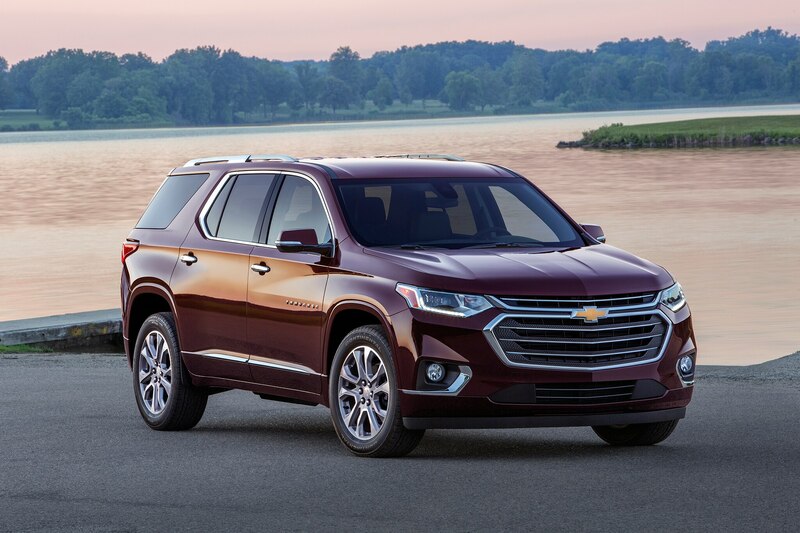 LAKE GEORGE, Michigan — The first-generation Chevrolet Traverse represented a brand and its corporation in transition, having launched the model year before General Motors’ bankruptcy. 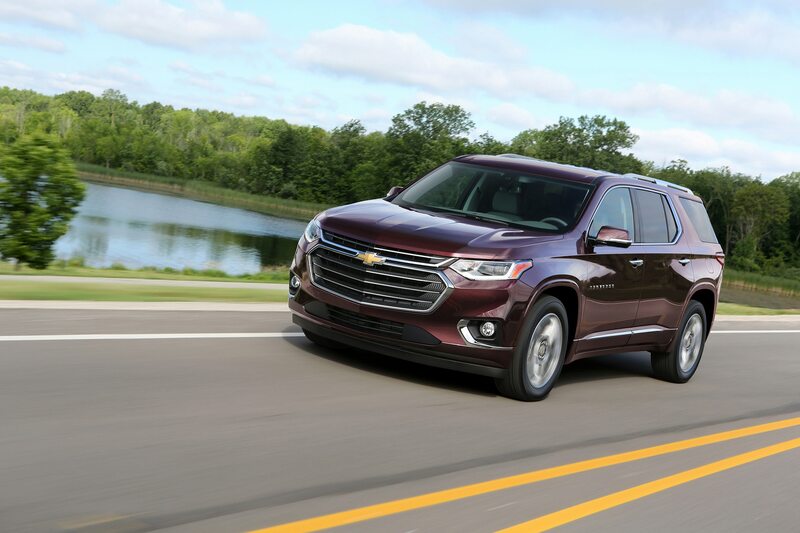 American families were starting to trade in truck-based sport/utility vehicles like the Chevy TrailBlazer for more carlike unibody front-wheel-drive-based SUVs. 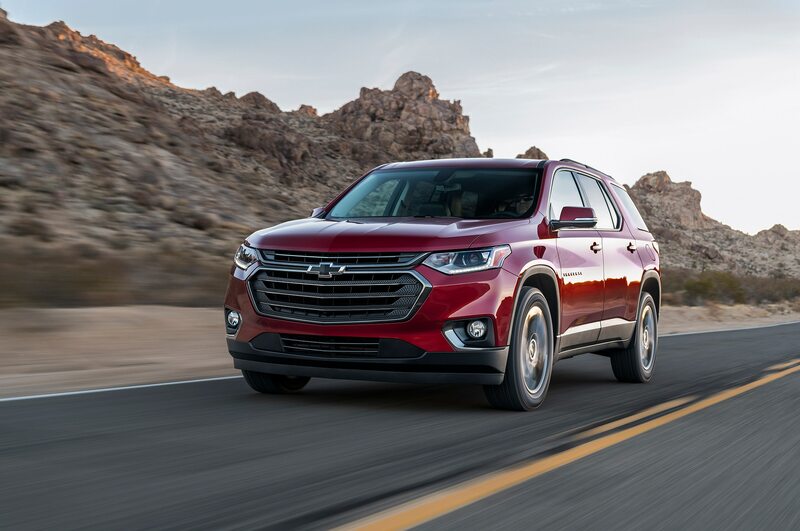 Ten years later, Chevrolet is stepping up its game in this segment, taking on leaders like the best-selling Ford Explorer, as well as the likes of the Jeep Grand Cherokee, Toyota Highlander, Hyundai Santa Fe and Honda Pilot, all of which are more popular than the Traverse. 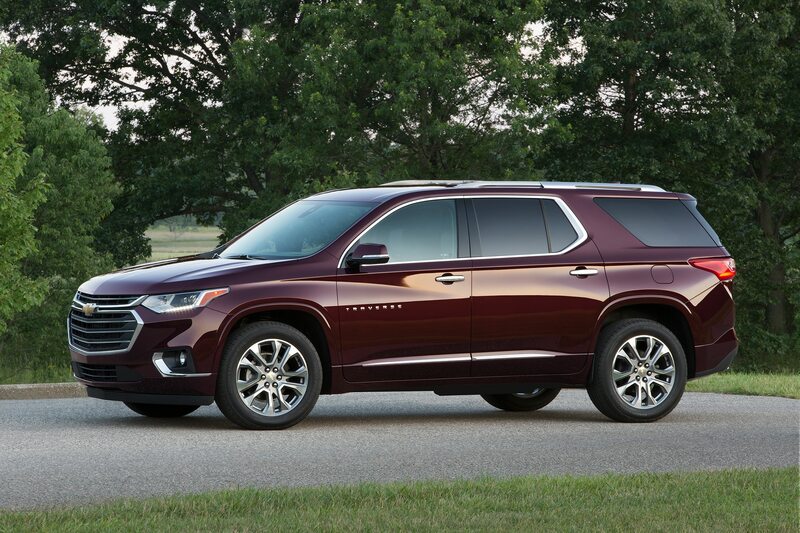 Even Chevrolet’s bigger, traditional Chevy Tahoe/Suburban combo outsold Traverse by more than 46,000 units last year. 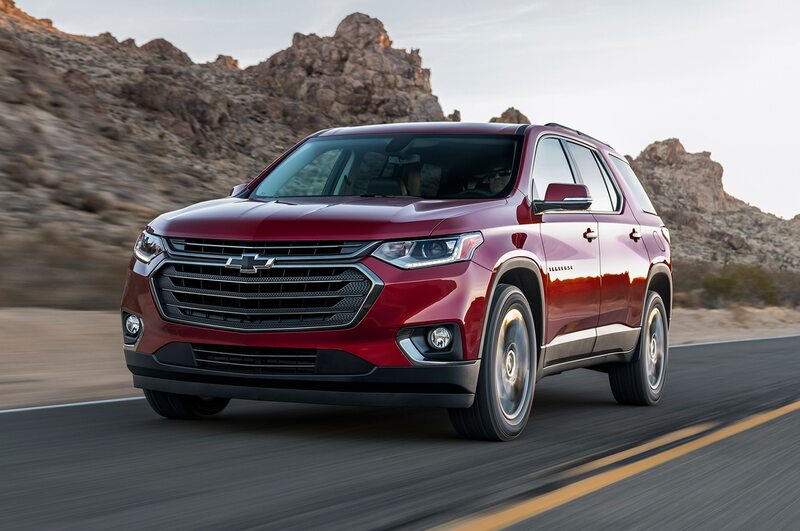 So the 2018 Chevrolet Traverse and its smaller compact sibling, the Equinox, are two key models in Chevy’s goal of becoming America’s number-one brand again. 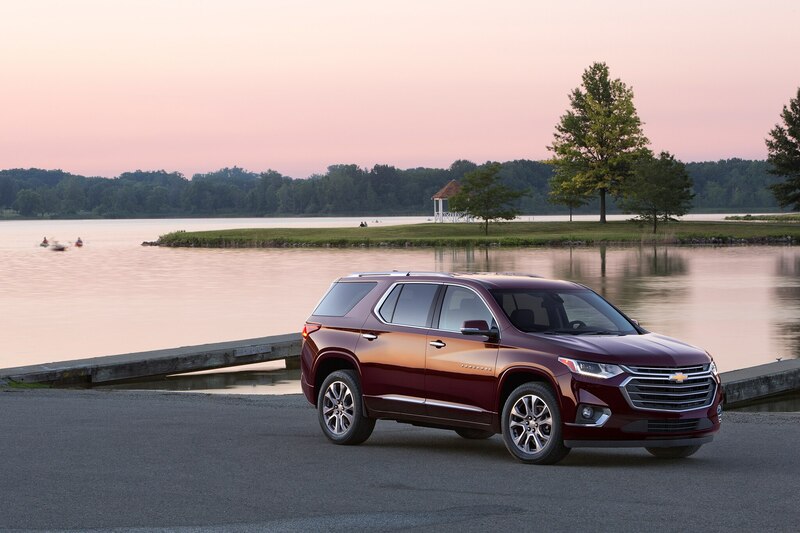 That means it must first catch Toyota, and then Ford, the latter of which outsold Chevrolet by nearly 391,000 units last year. 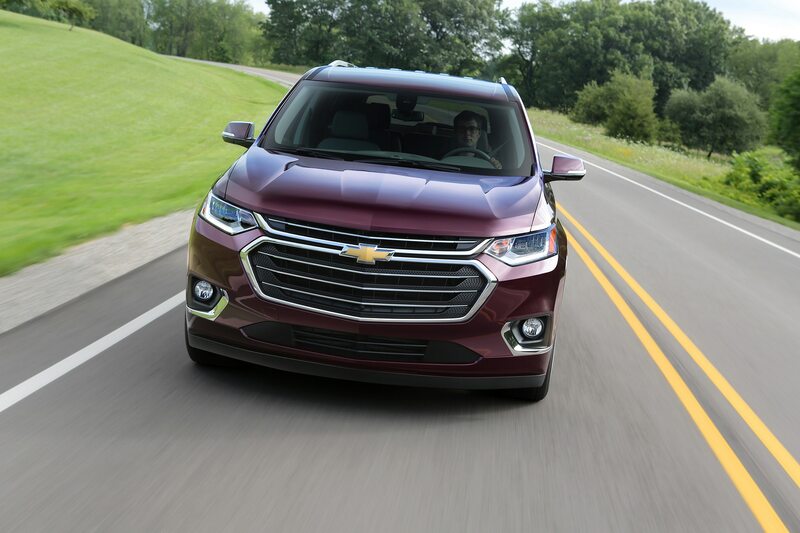 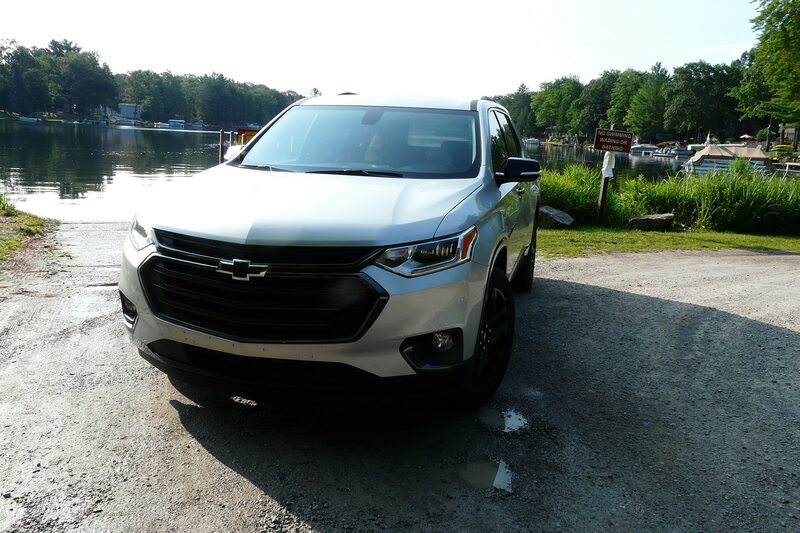 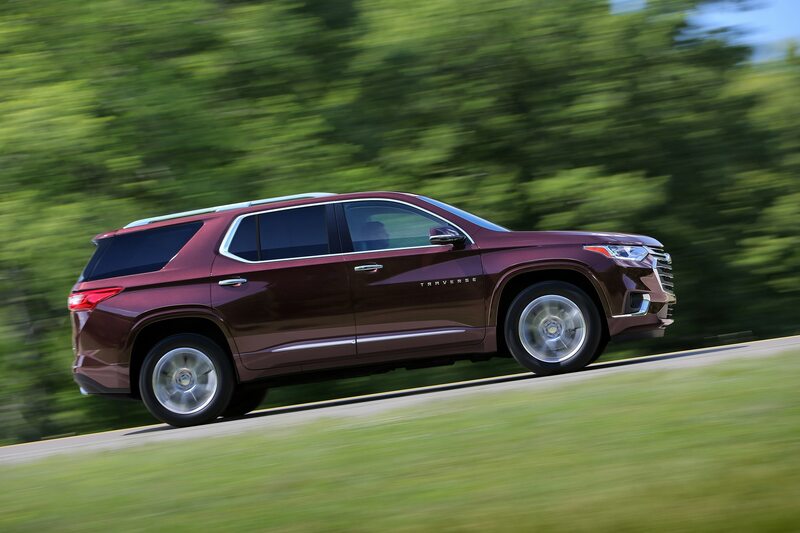 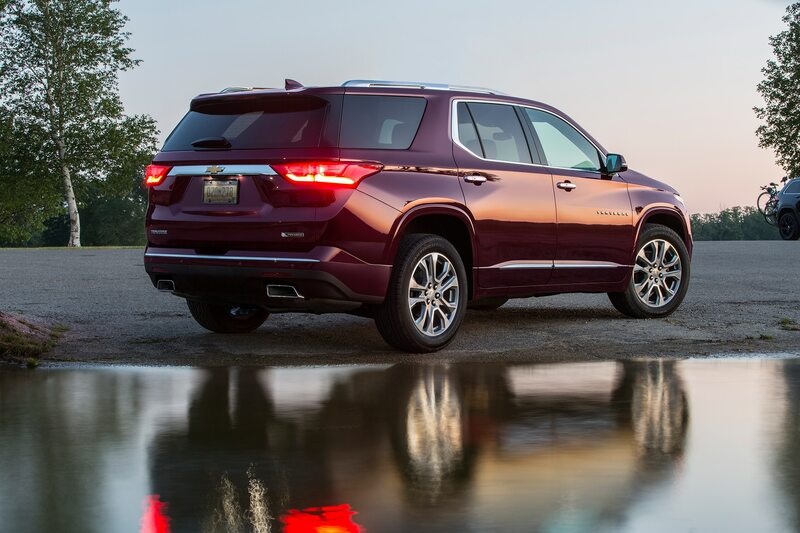 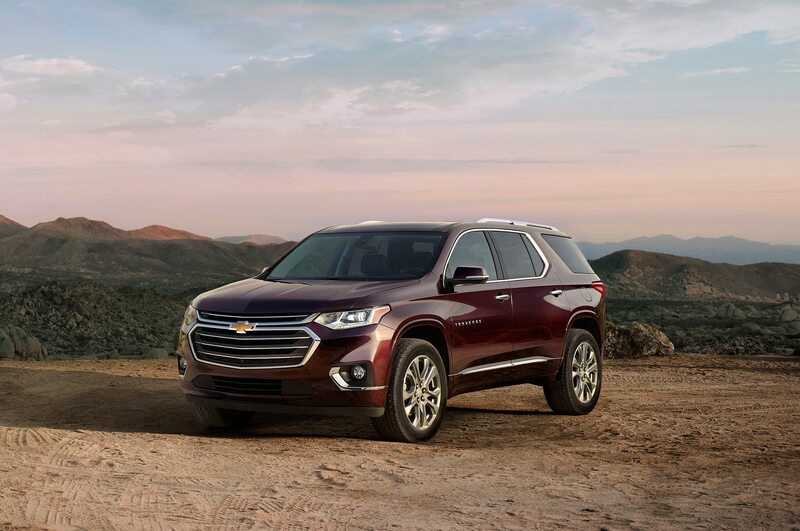 To drive its competitive points home, Chevy offered journalists a chance to take their families to various Michigan resorts (yes, we have them) for the weekend in order to best enjoy the Traverse’s qualities. 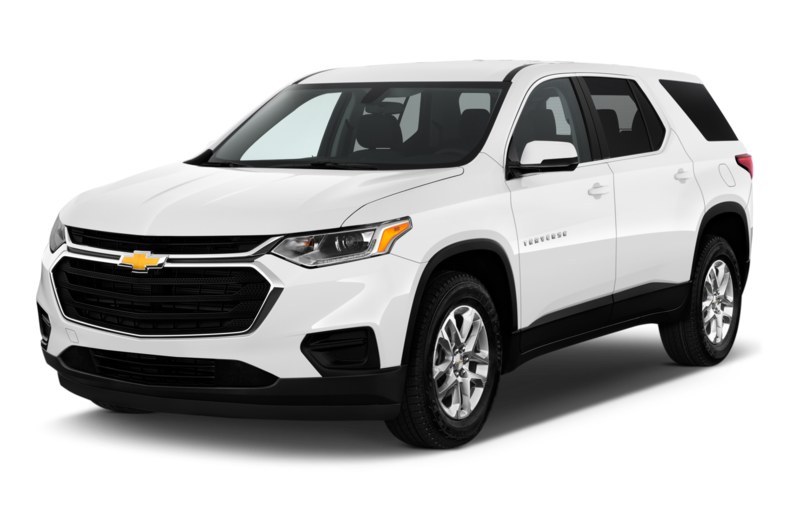 No one among Automobile’s Detroit Bureau-based staff has kids, but my wife, Donna, and I have three collies in our family. 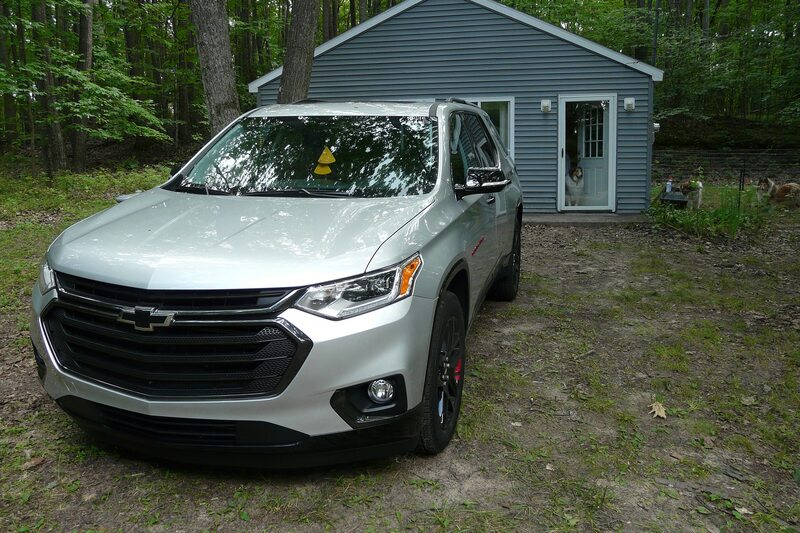 We took up Chevy on its offer of a new Traverse for the weekend, and turned down the resort lodging offered as our destination in favor of our newly purchased, dog-friendly cabin off Lake George in the north-central part of the state, about 180 miles away. 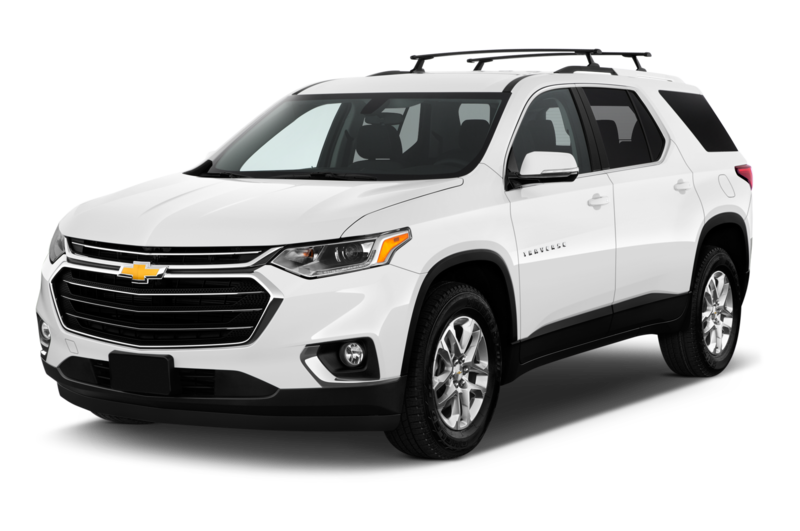 Outside, the new Traverse shares Chevy’s very handsome design language and its coke-bottle body forms with the new Equinox. 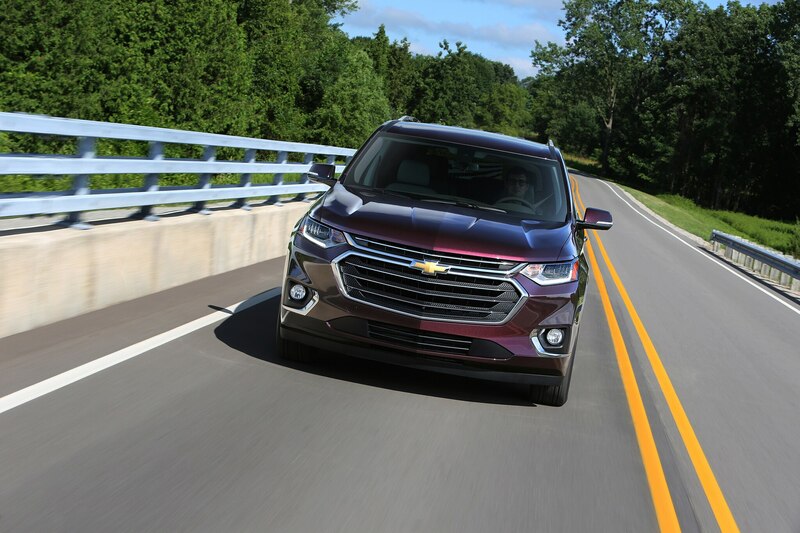 The two SUVs recall the organic, fuselage-style profiles of Chevy’s glory years in the 1960s and early ‘70s. 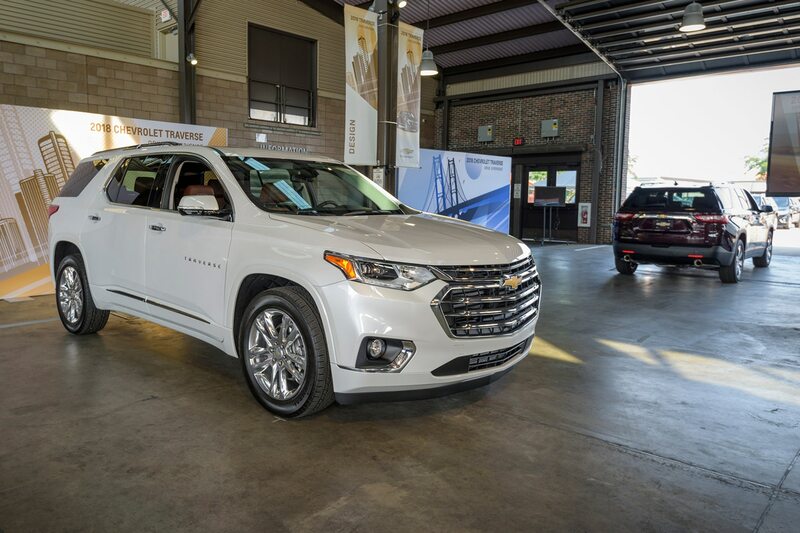 Chevy says that the all-new Traverse is only slightly larger than the first model, with a 2.0-inch longer wheelbase and a slight increase in overall length, but significantly more interior space. 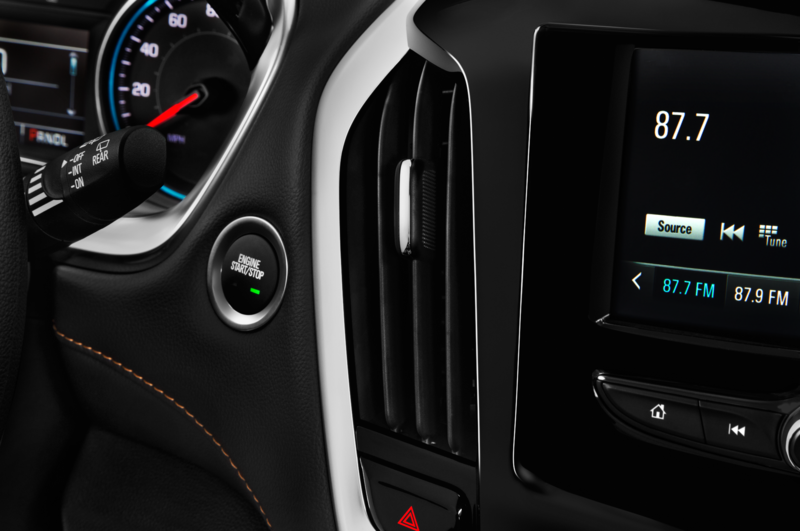 “We wanted the feeling and the presence of a truck,” says designer Rich Scheer. 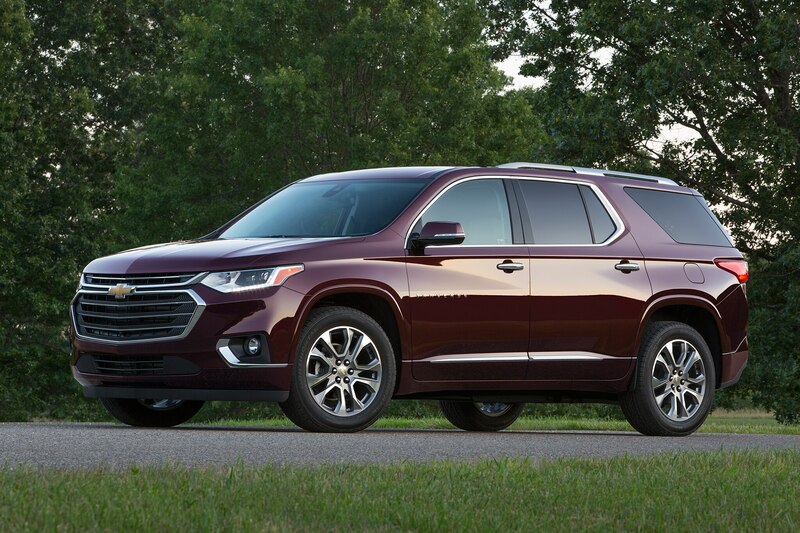 It has ‘Tahoe DNA’—more SUV than CUV, he says. 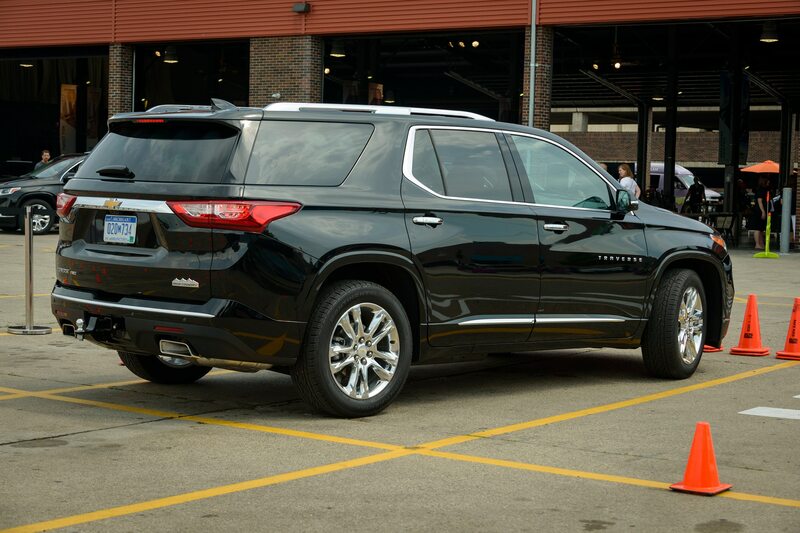 I think the new Chevy Traverse looks much sleeker, tighter and less people-mover-like than the old Traverse. 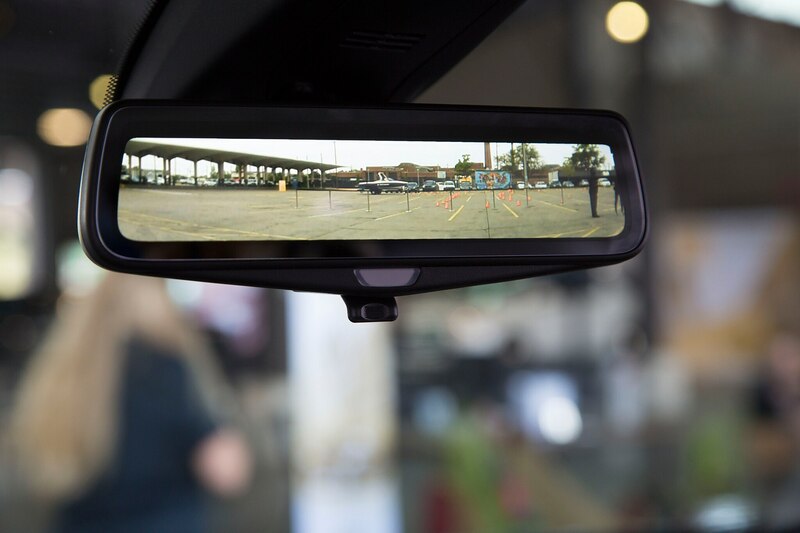 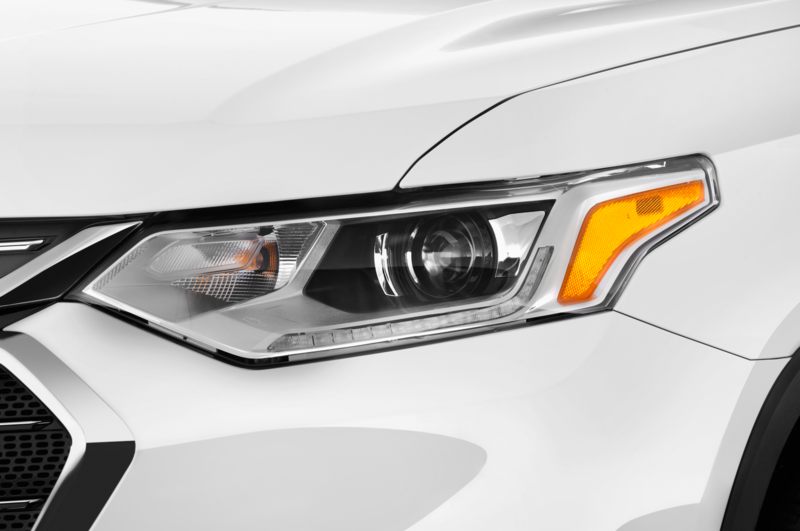 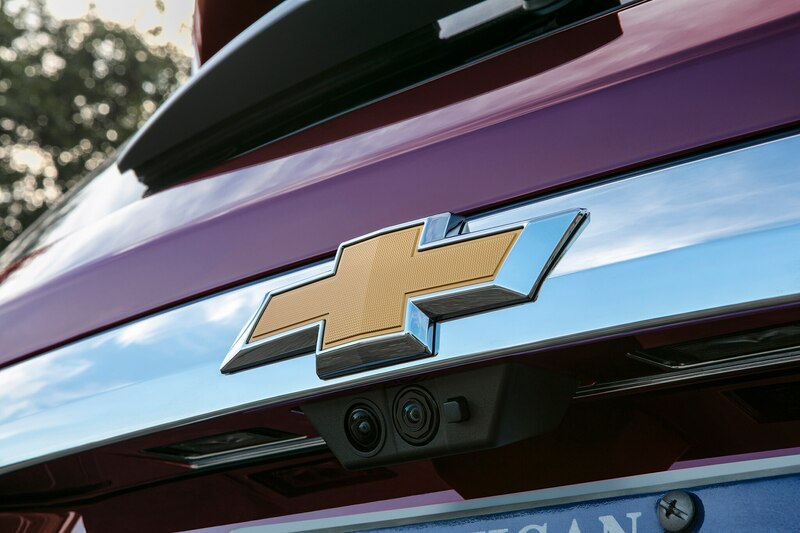 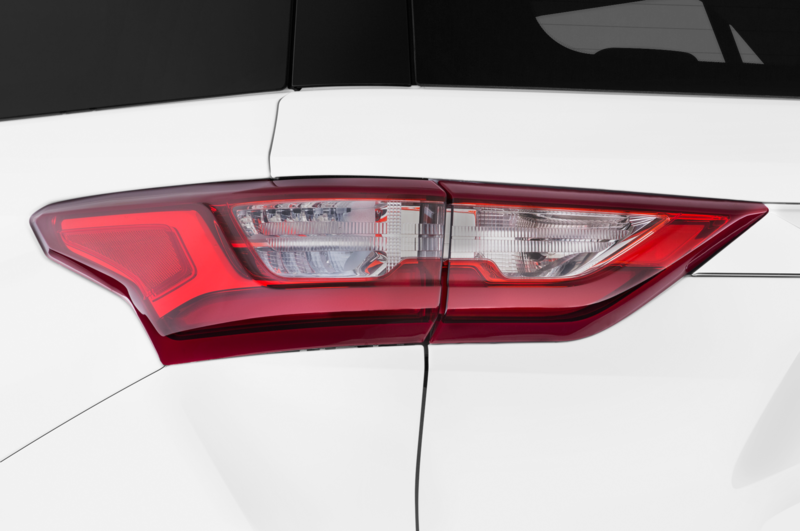 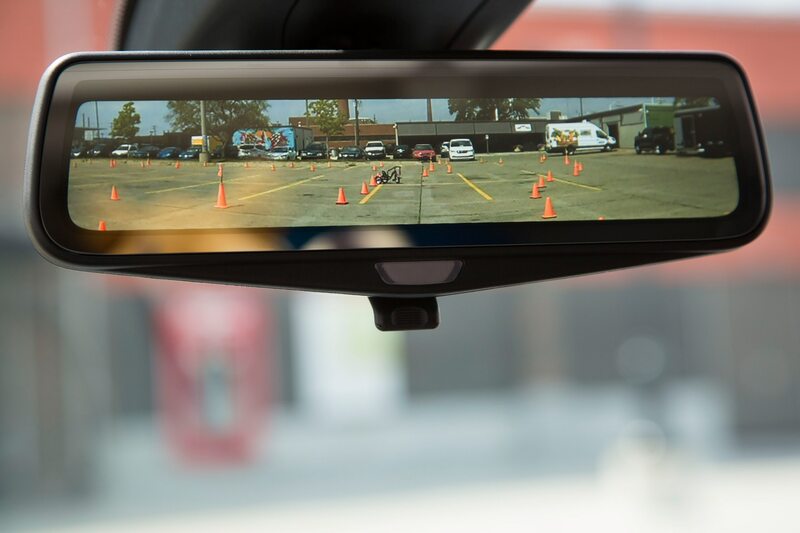 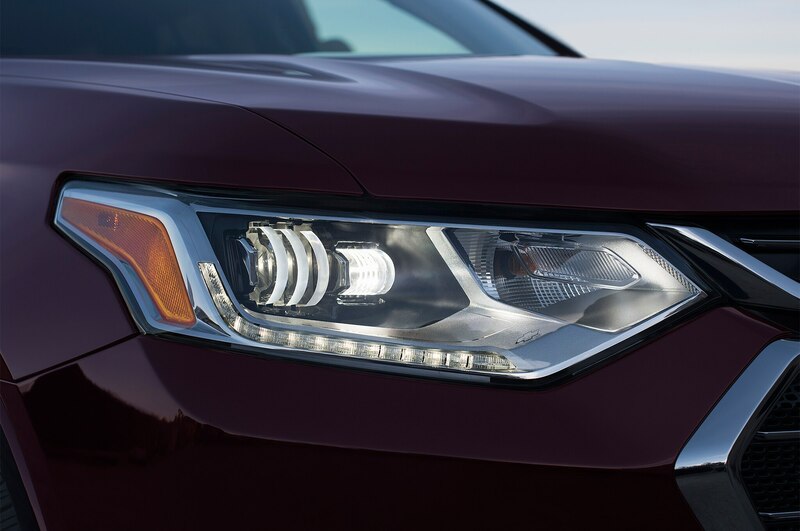 “The fact that the truck studio designed this model is not a happy accident,” says Steve Majoros, marketing director for Chevrolet cars and crossovers. 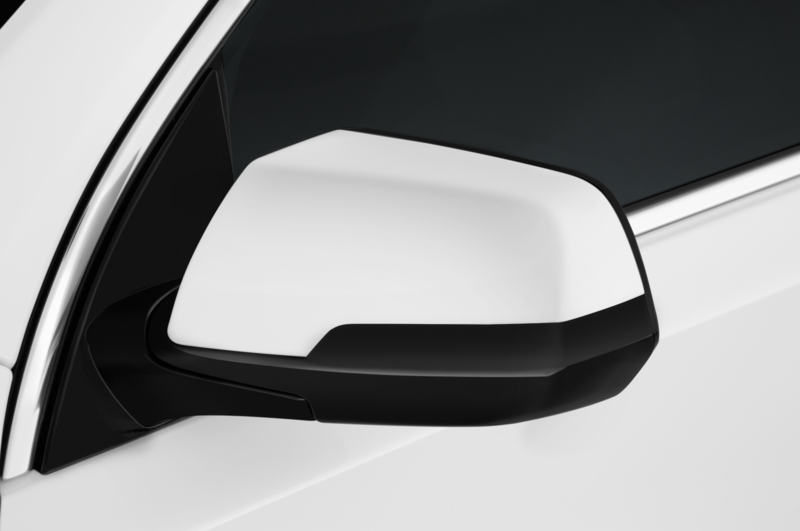 That’s a major hint. 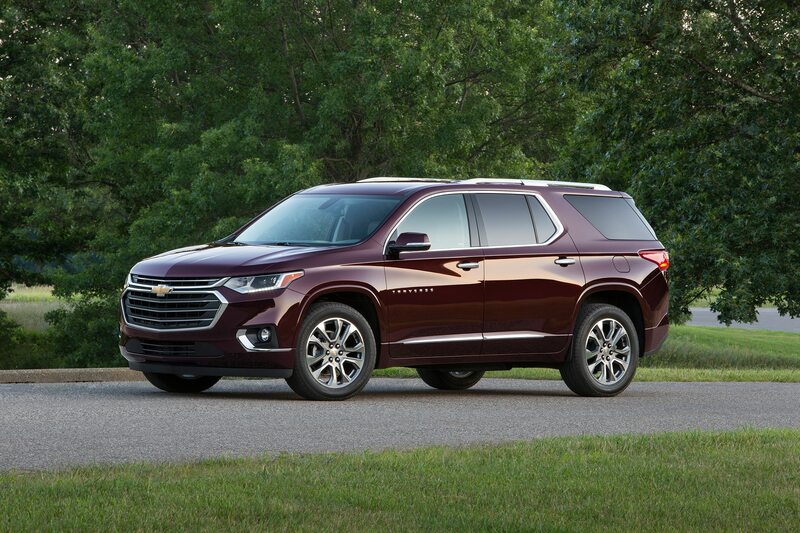 We know the 2019 Chevrolet Silverado and 2020 Chevy Tahoe/Suburban will be radically updated, with sleeker, more aerodynamic styling, so it’s pretty clear that the 2018 Chevy Traverse is a 7/8-scale preview of those full-size trucks. 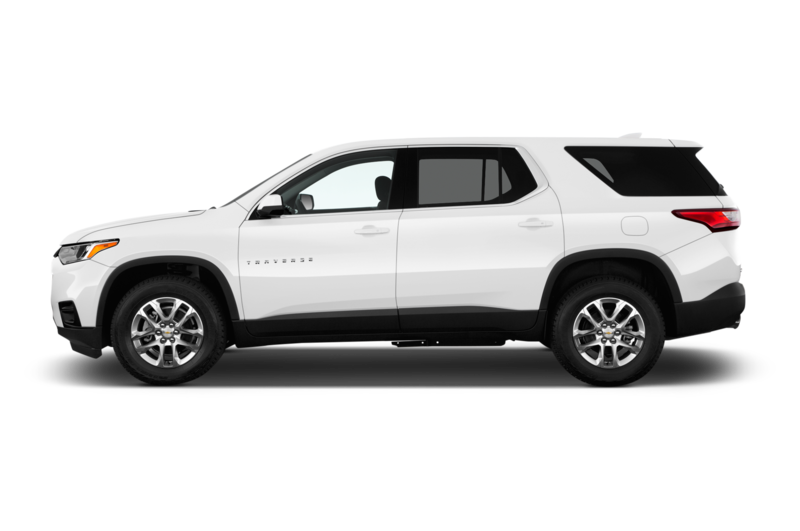 Imagine the next Tahoe/Suburban as a larger, longer Traverse. 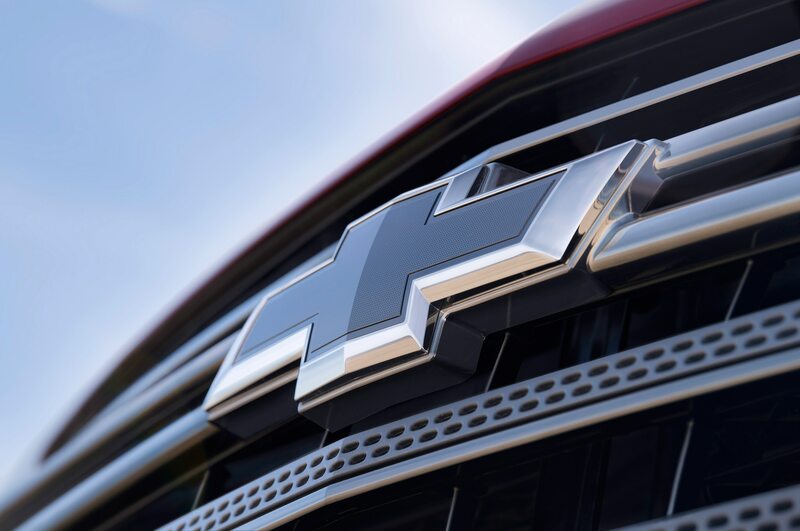 Cut the top off aft the b- or c-pillar, throw a solid rear axle back in, and you have the next Silverado. 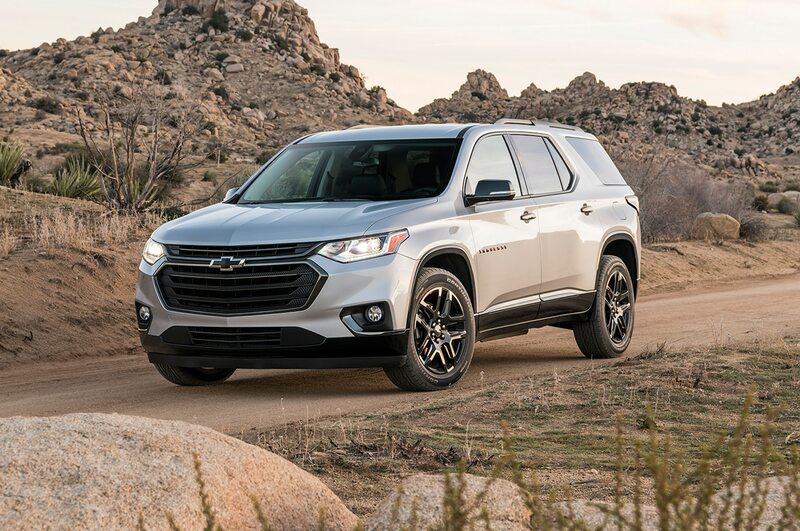 Whether this styling translates into being more truck-like or not, it works, and it should move the metal among mainstream consumers, who typically list “styling” as a major purchase consideration. 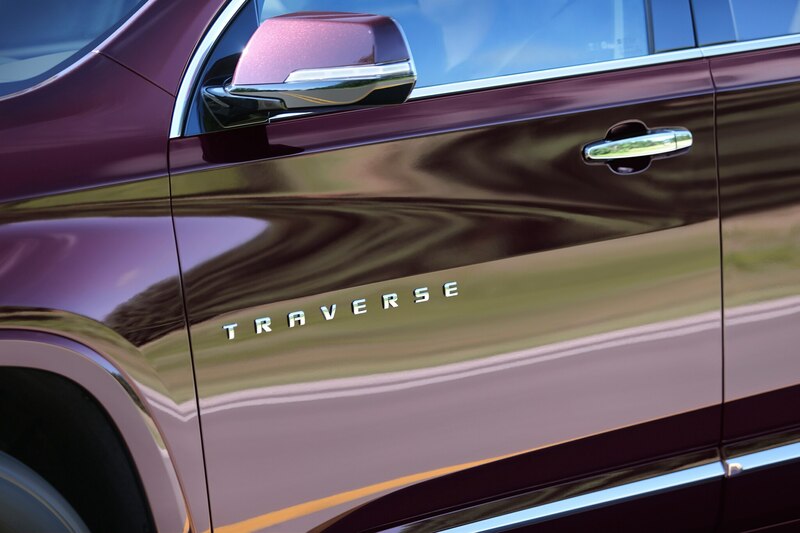 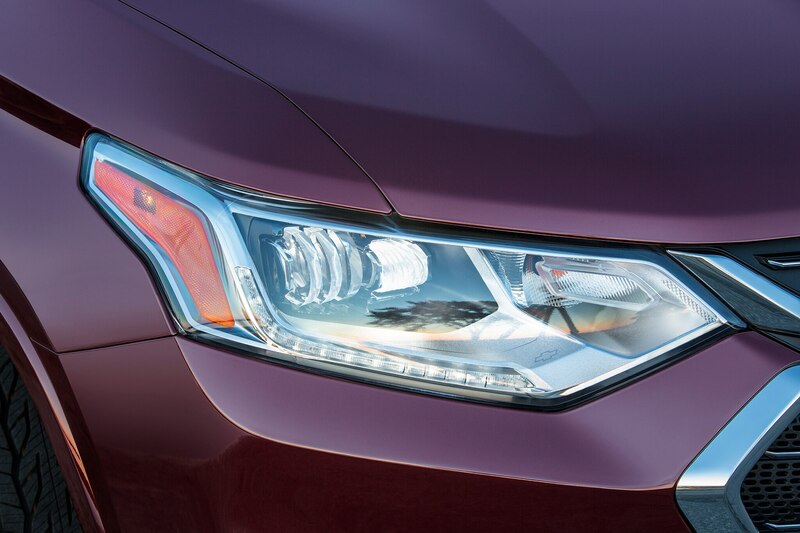 Underneath, the 2018 Traverse is all-new. 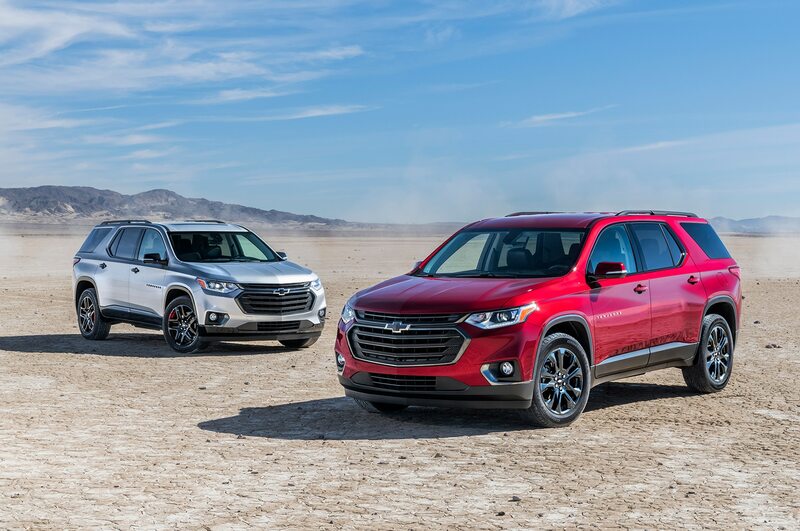 It rides on the C1Y platform shared with the smaller GMC Acadia and the coming Mark II Buick Enclave. 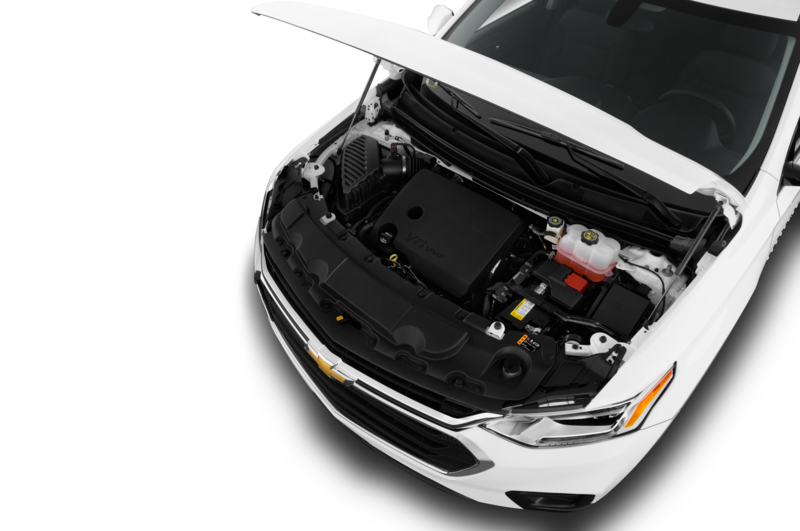 Its 3.6-liter V-6 is the only carryover piece, and only engine choice thus far. This is not the 3649-cc V-6 with Active Fuel Management (cylinder shut-off) introduced in the Cadillac CT6, but instead an updated version of the 3564-cc High-Feature V-6 that’s been on the market for more than a decade. 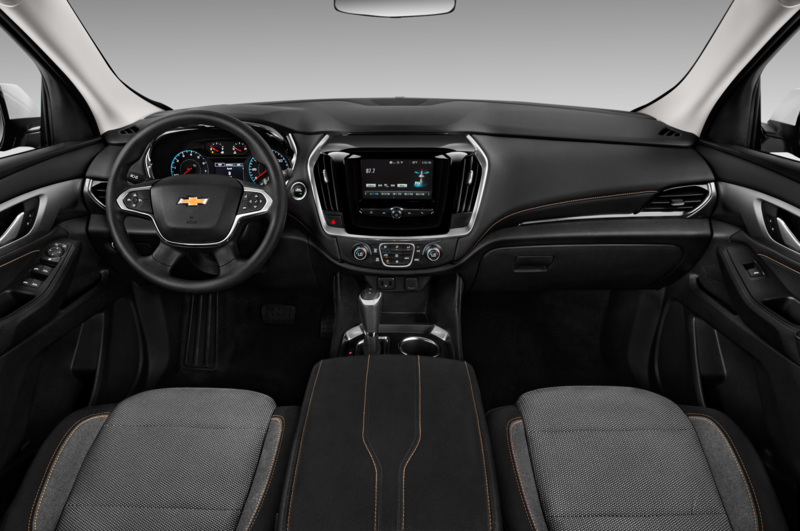 It’s coupled to GM’s new 9-speed automatic transmission, and features stop/start technology, with no shutoff switch for the driver. 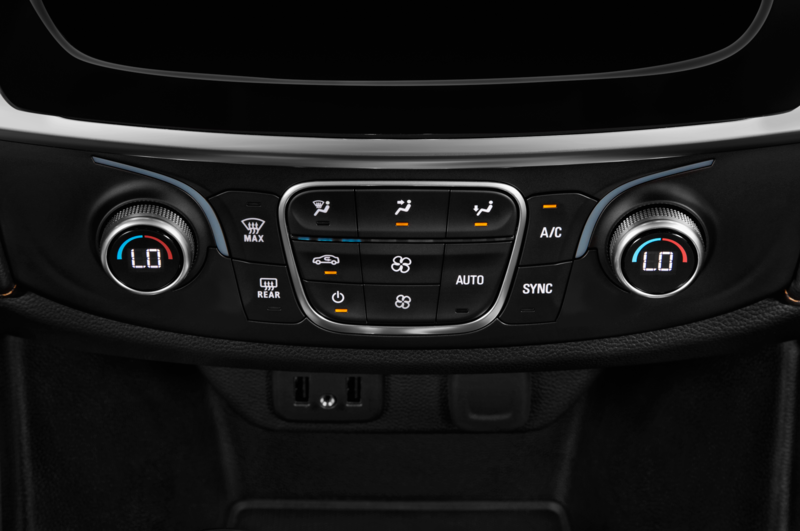 Manumatic control is limited to a button on the gearshift, and the driver may select a range of gears among the nine while in tow mode. 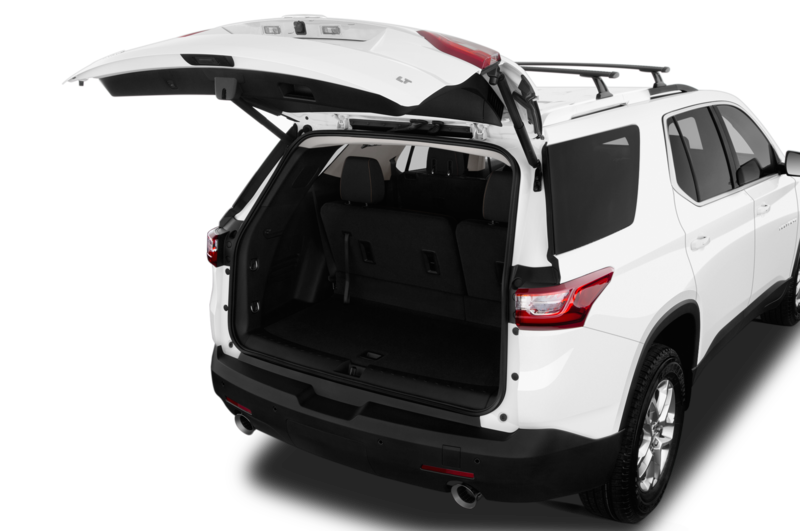 The suspension of the Traverse has MacPherson struts up front and a five-link rear. 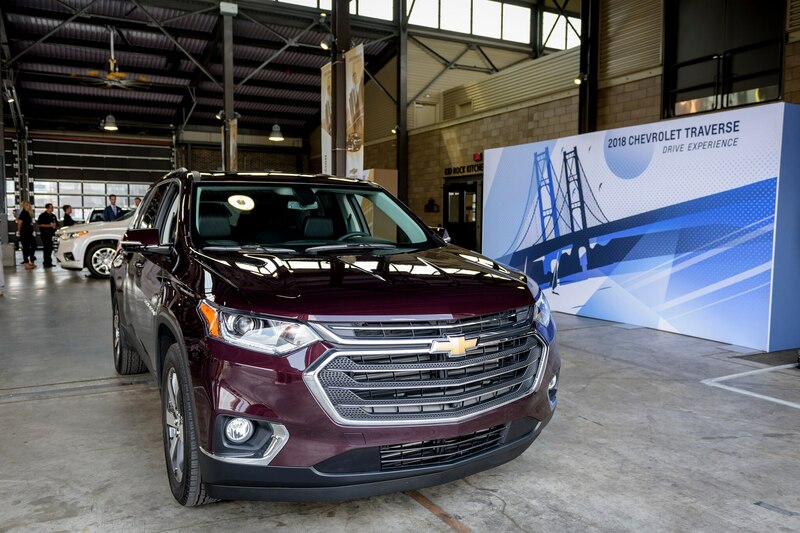 Chief engineer Dean Perelli points to the Sachs PLV passive dampers with rebound springs in the rear as an important addition. 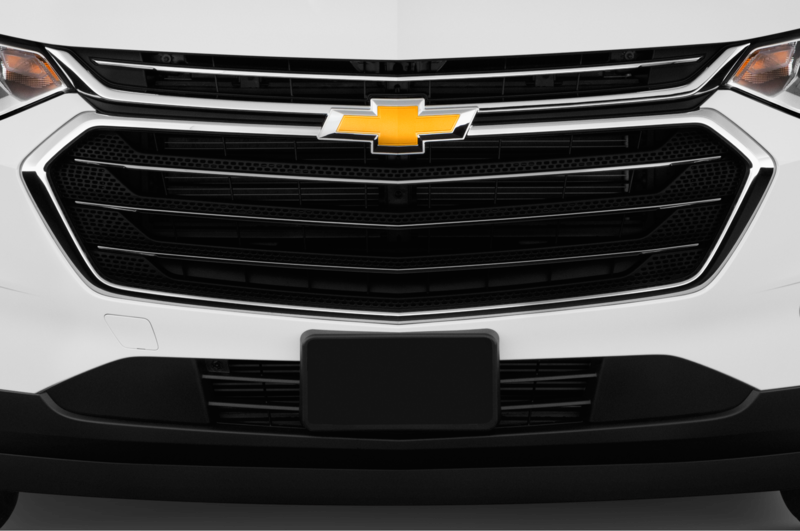 A urethane vertical bar inside the spring coils, called a Spring Aid, serves as a jounce bumper. 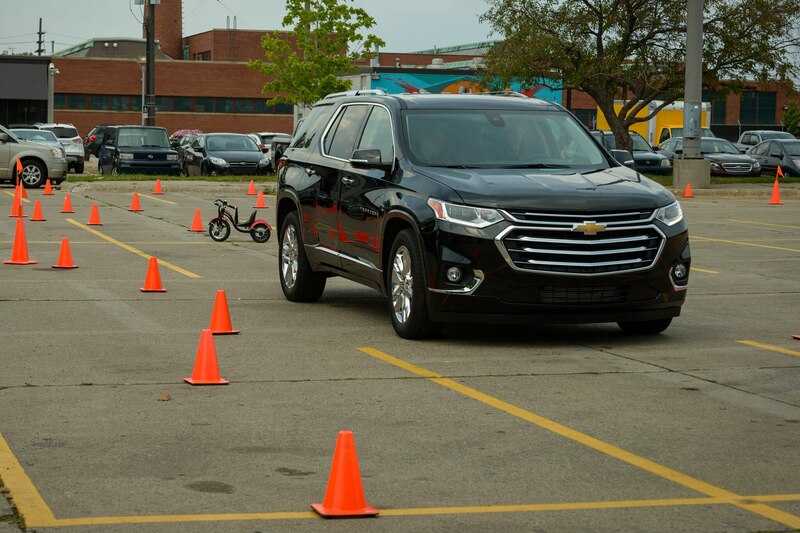 The result is a soft, supple ride, but with good handling, Perelli says. 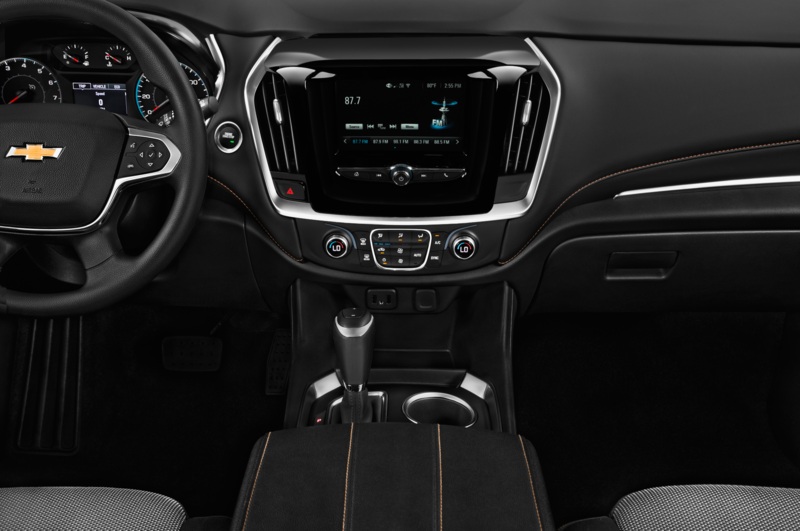 The electrically assisted power steering has variable effort, and the turning diameter of 39 feet is about 1.5-feet tighter than the old model’s. 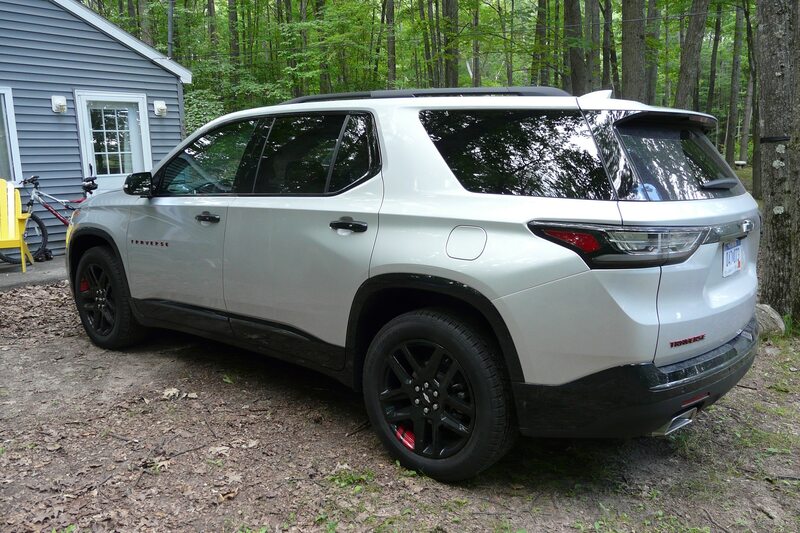 Base wheels are 18-inchers, but our spiffy-looking Traverse Premier’s $2,495 Redline Edition appearance package adds 20-inch aluminum wheels and paints them black with red accents. 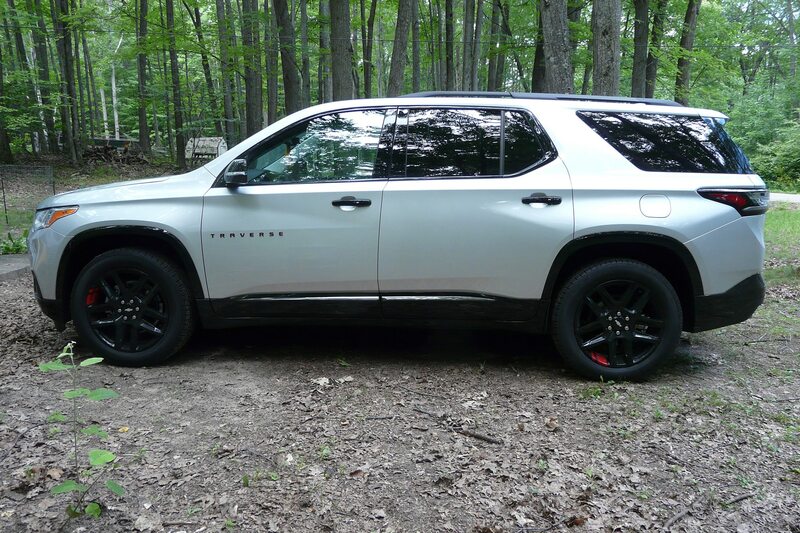 It also blacks out the chrome trim and the bowtie badges and adds a dual Skyscape sunroof and the trailering package. 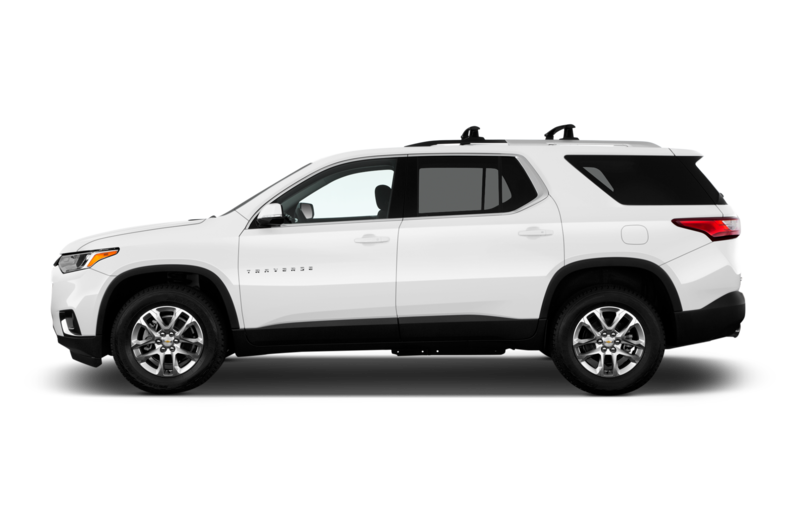 Donna and I headed for the cabin late Friday afternoon, the Traverse loaded up with our three collies and just a couple of bags. 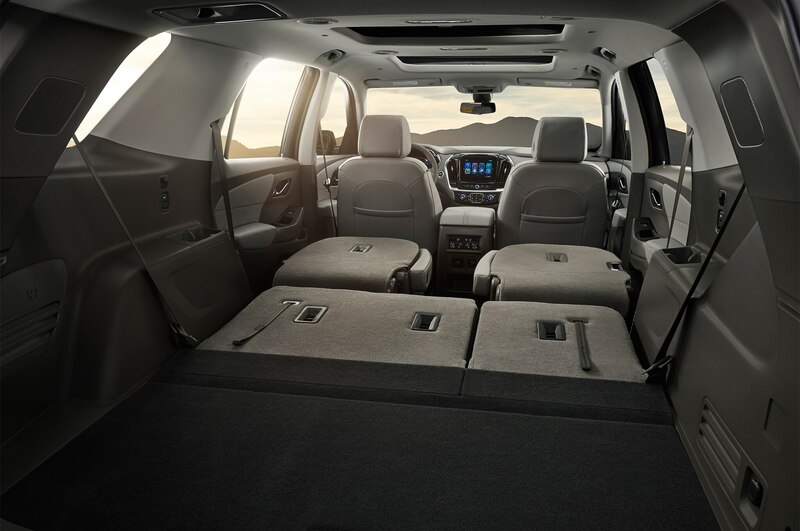 The Traverse’s three rows of seats meant nothing to us. 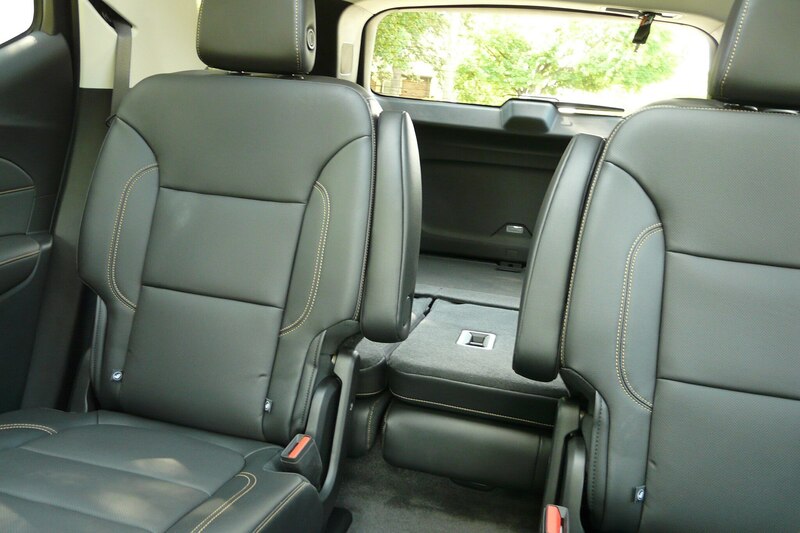 We folded down the second-row captains chairs and the third row bench, and tried to fill in the space between those second-row seats with bags in order to keep the floor as flat as possible for the dogs. If you have dogs and no kids, you’ll want the second-row bench. The updated V-6 is smooth and powerful, with really nice throttle tip-in. 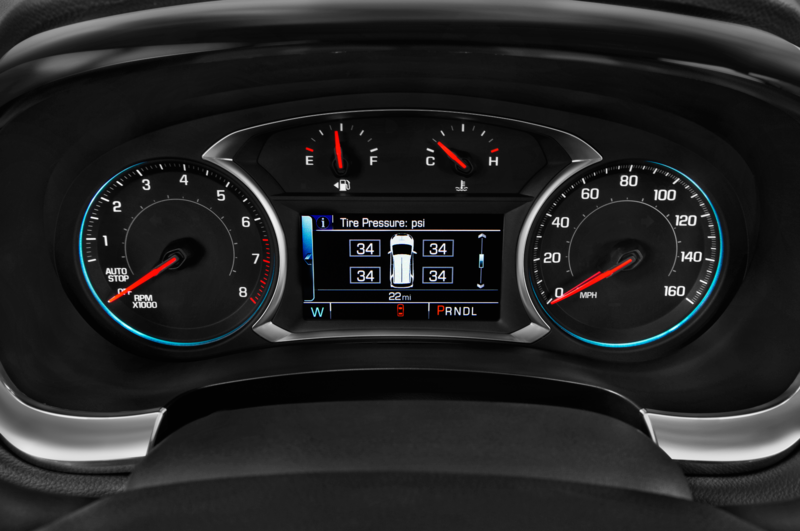 Keep your right foot in it and the 3.6 rewards you with a subtle motorboat trill as you smoothly and quickly reach the mid- and upper-rev ranges. 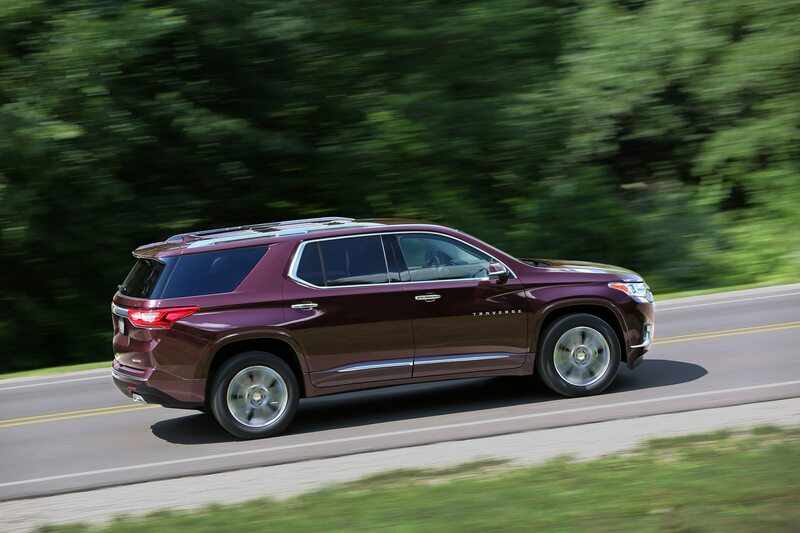 Chevy says 0-60 mph comes in less than 7 seconds, respectable for a 4,362-pound three-row SUV. Ours was a front-wheel-drive model, closer to the stated curb weight than one with the optional all-wheel-drive system. 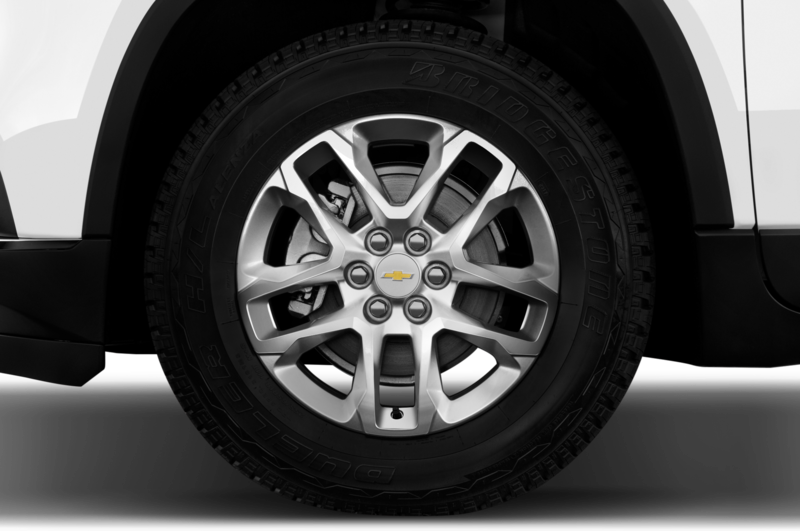 The Traverse’s suspension and steering work as Perelli advertised. 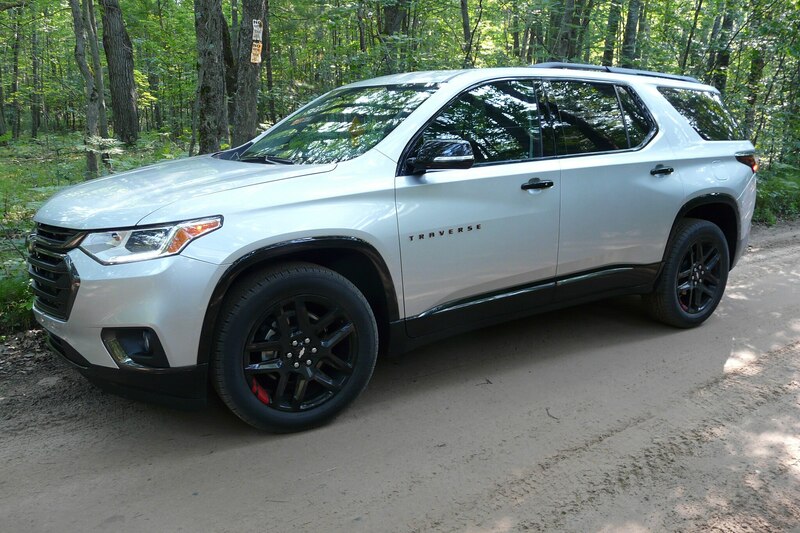 It’s probably the smoothest and most comfortable ride among SUVs in this segment, nicely soaking up the expansion strips and the crumbling bits of Michigan’s I-96 and State Highway 127. 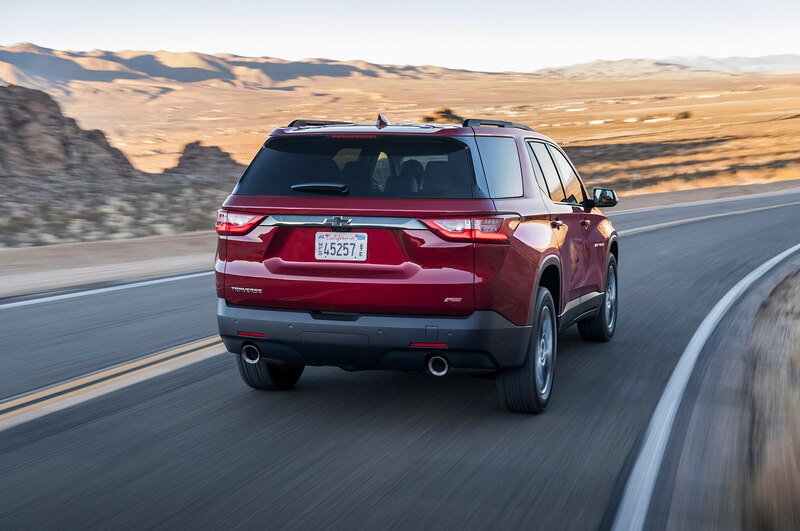 The jounce control means that dive isn’t bad when sudden brake lights ahead force a harder-than-usual stop. 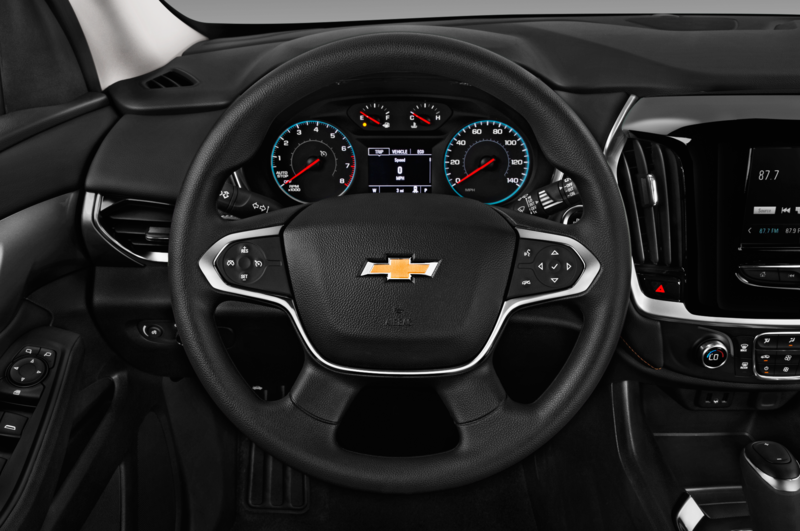 The steering is precise and light, offering good feedback, though the ratio isn’t so quick as to feel too twitchy for such a big, tall sport/utility. 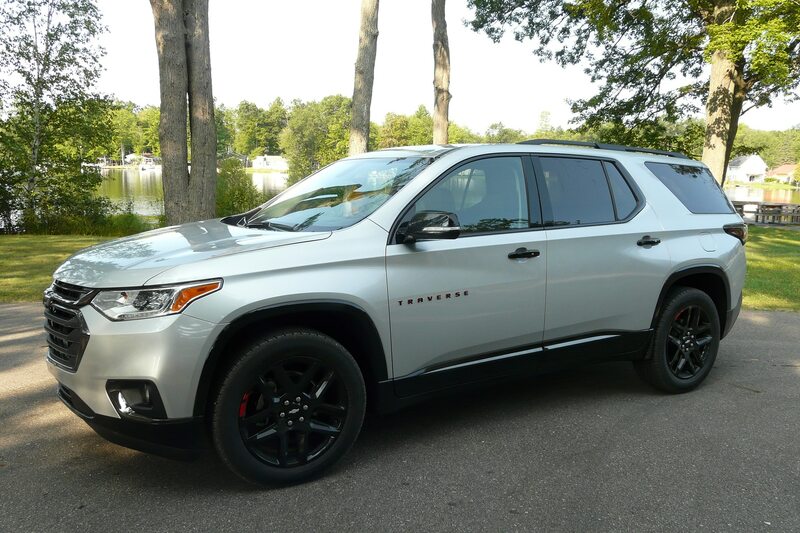 This is a comfortable, well-balanced SUV that will suit a family with a sportier, more enthusiast-oriented car on the other side of the garage. Donna was happy to find that the front passenger seat, like the driver’s seat, has power lumbar support, a feature all too rare, even in luxury models. 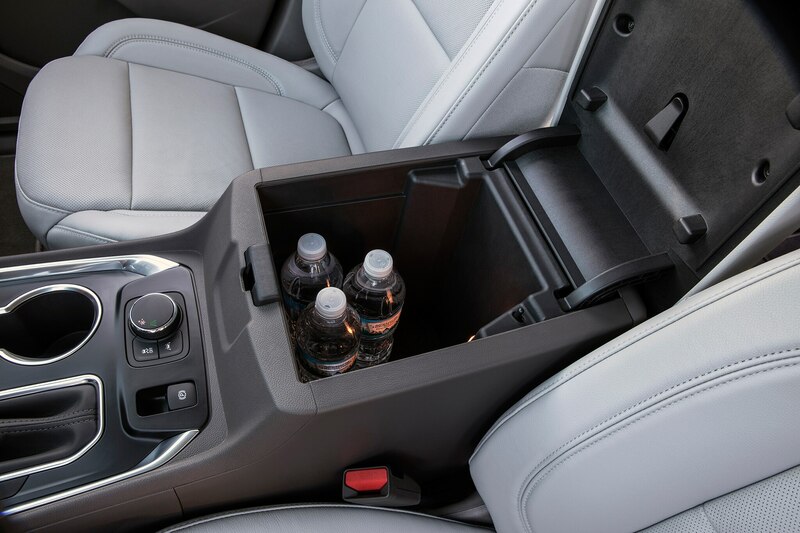 We ran the front seat coolers on the way up to Lake George. 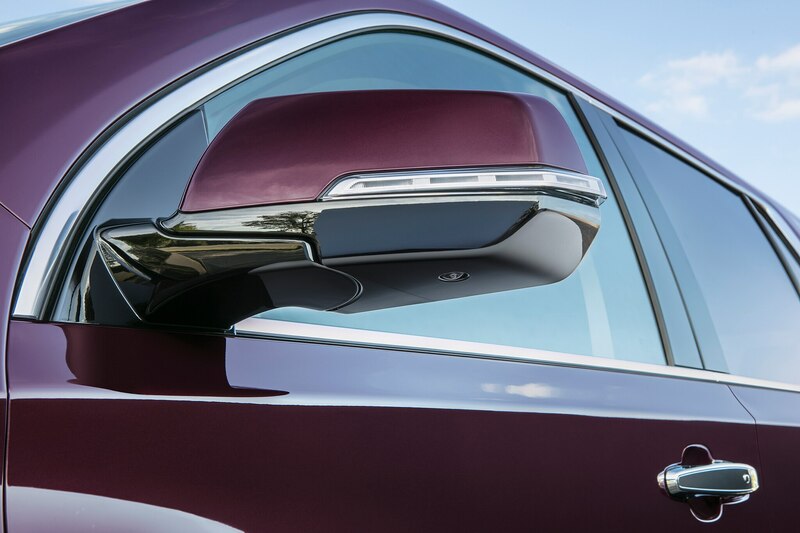 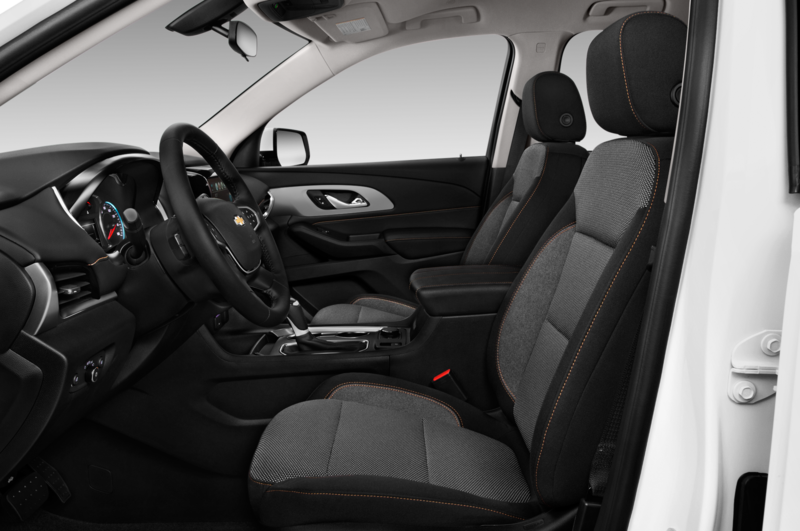 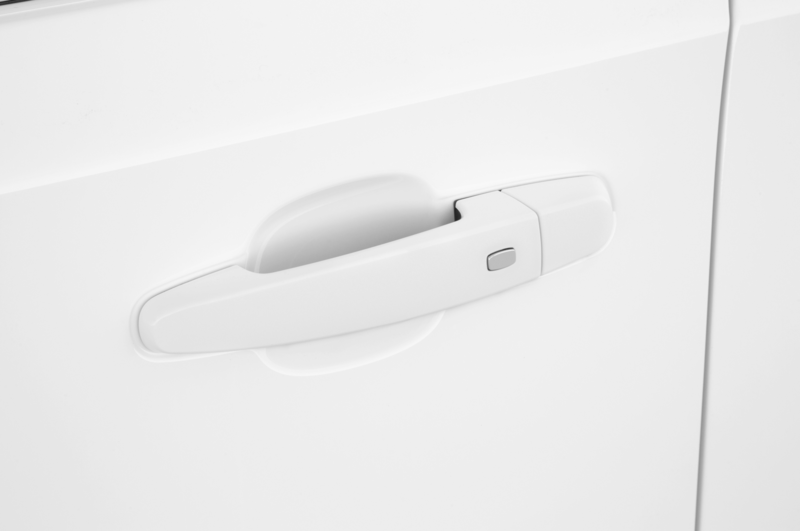 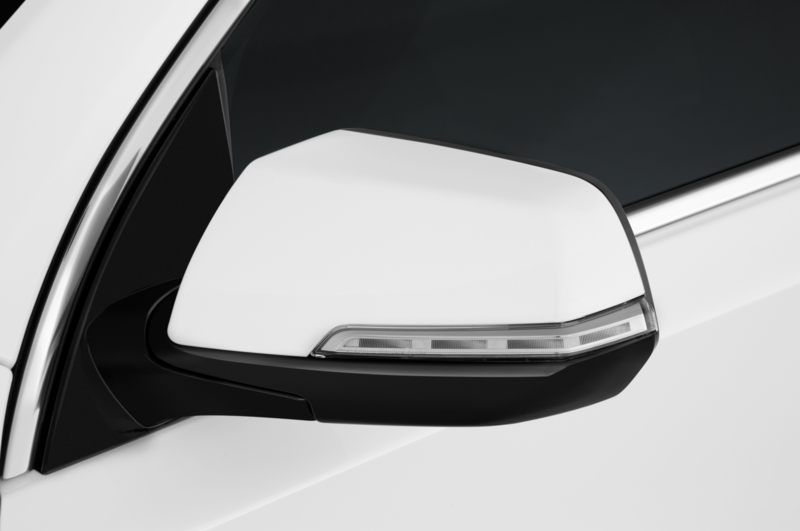 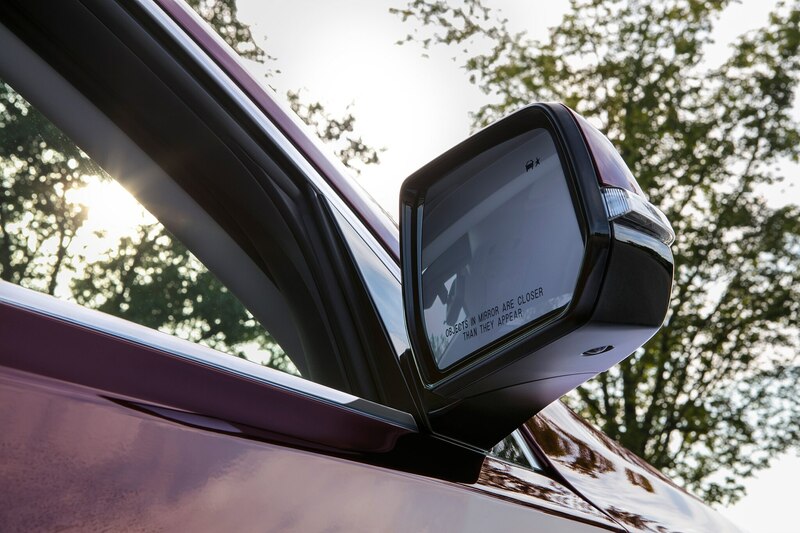 Interior materials and fit-and-finish are state-of-the-art for a brand offering luxury at a commodity price, with rich-looking padding on the dashboard and better-than-average plastic finish on the lower parts of the doors. 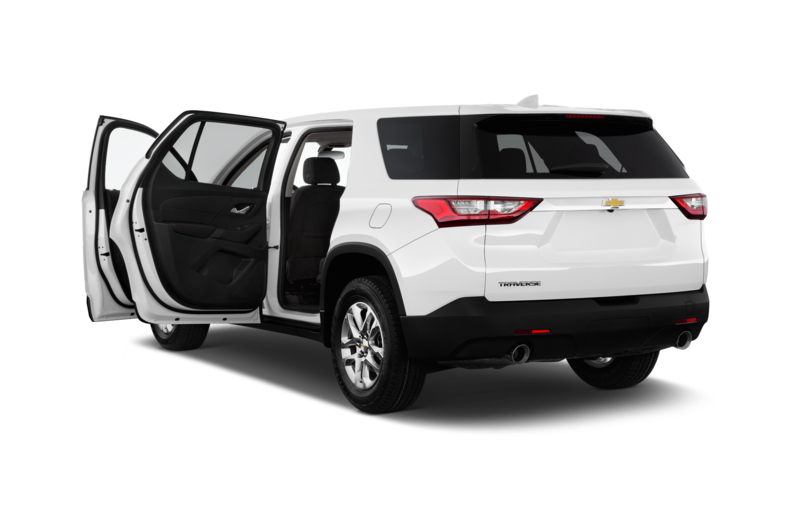 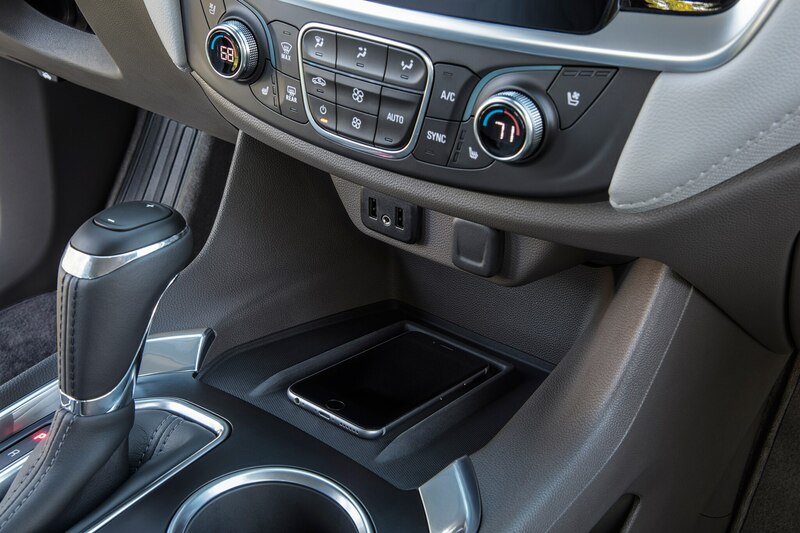 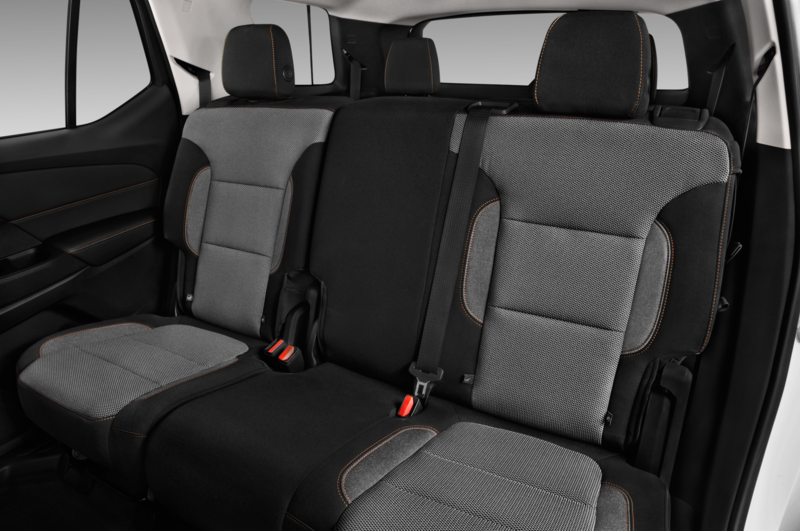 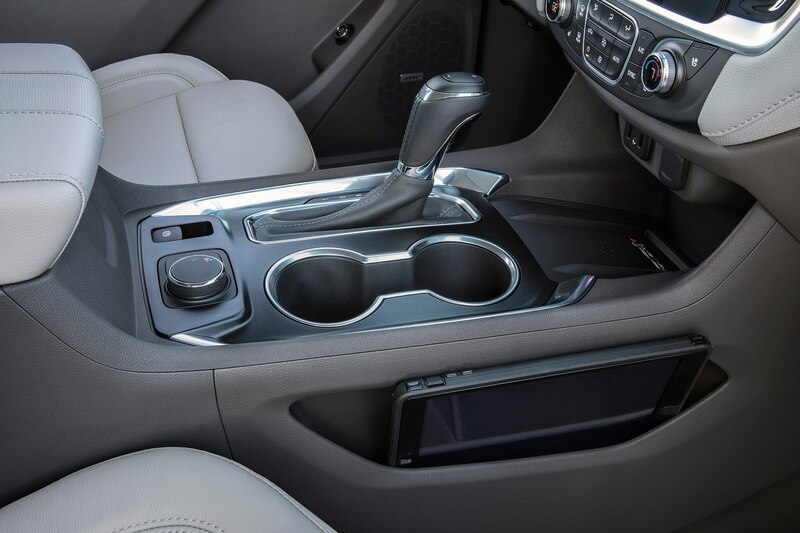 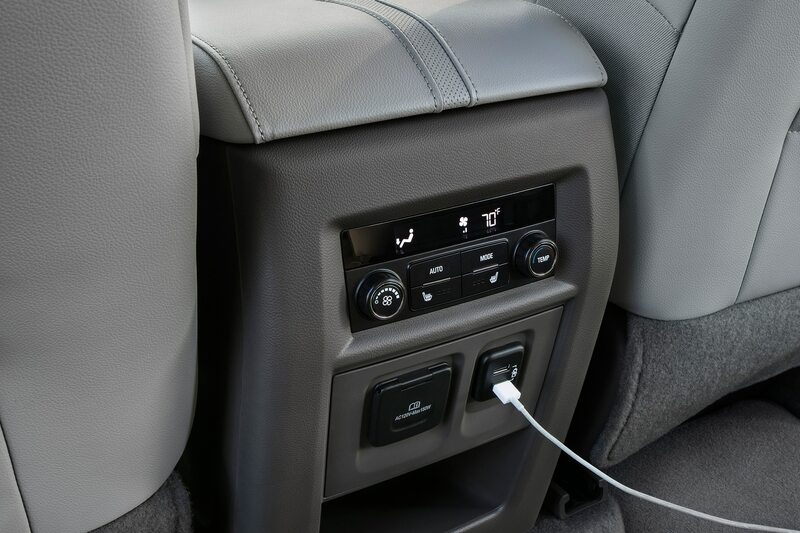 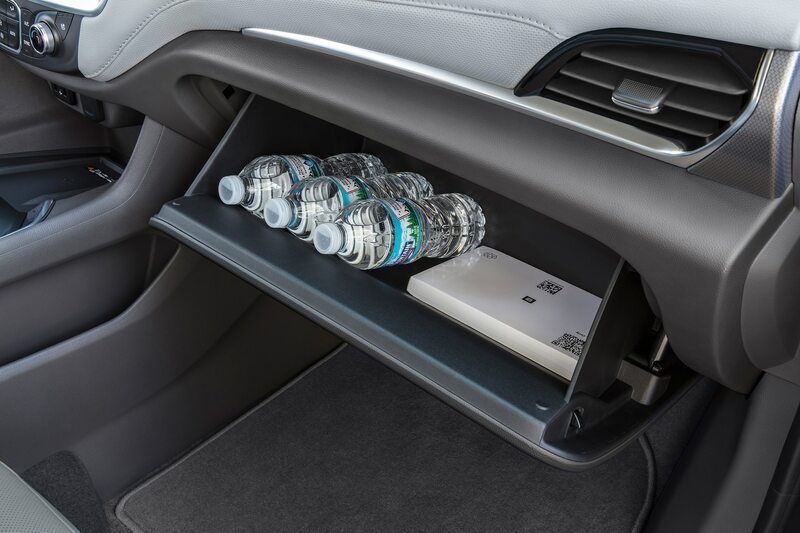 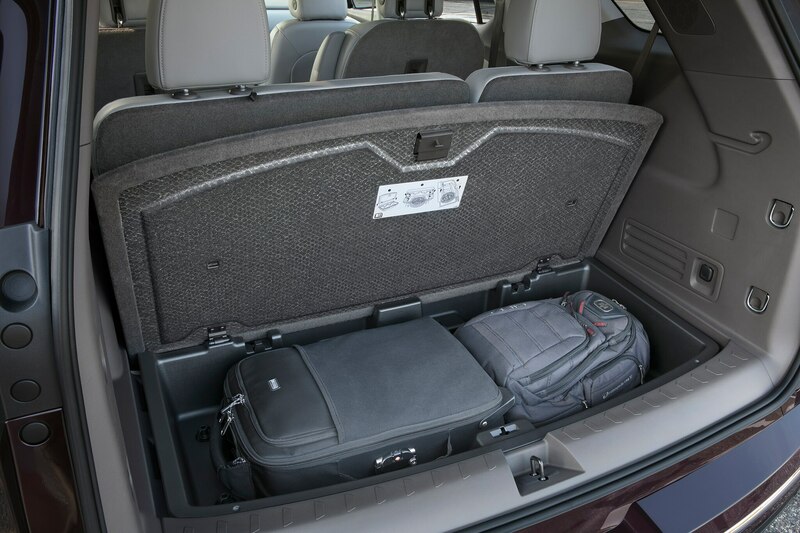 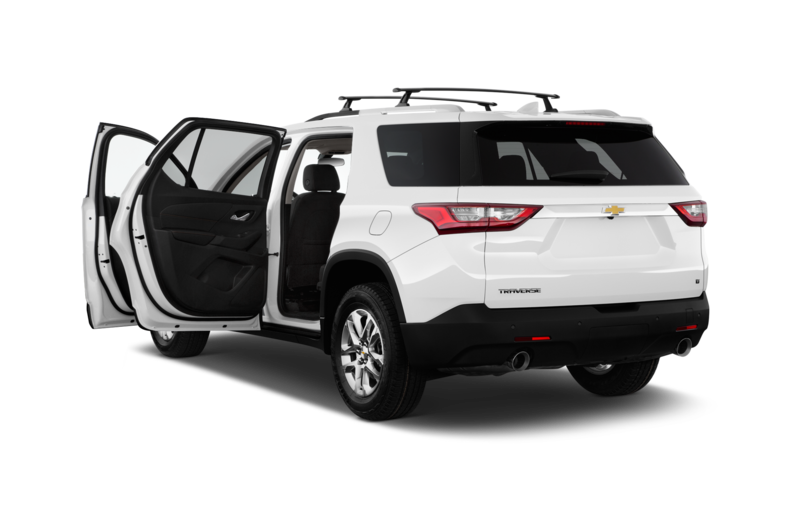 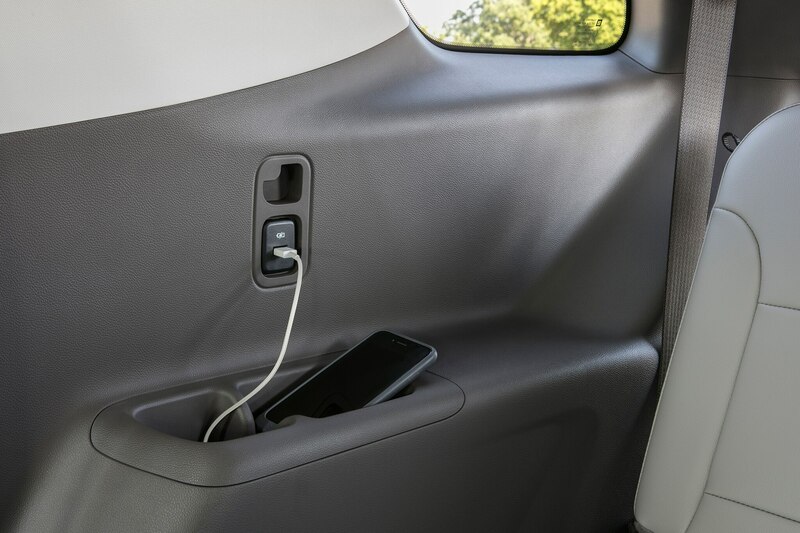 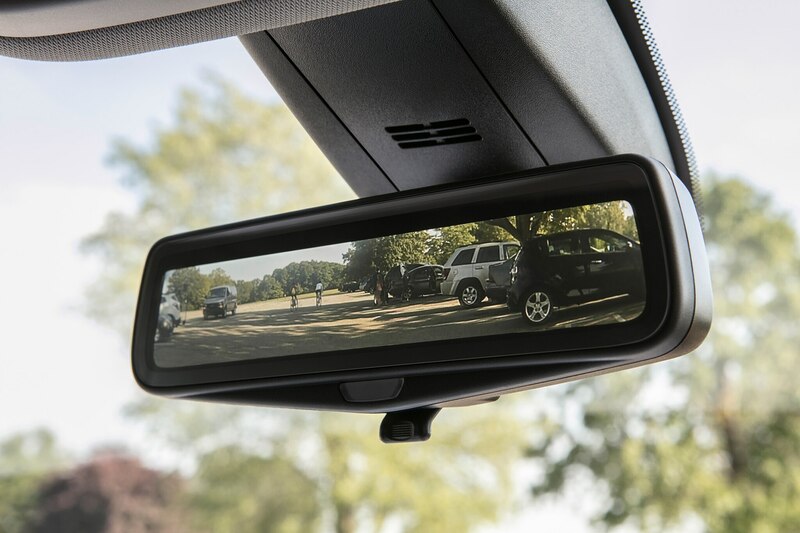 The Traverse has a lot of convenient storage, including a hidden compartment behind the power-operated radio/navigation screen and a deep compartment under the cargo load floor that’s good for carrying food right under the dogs’ paws. 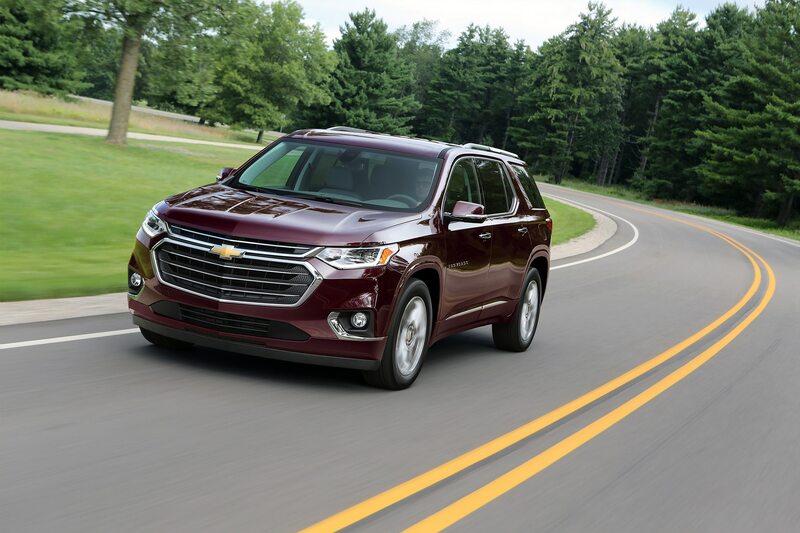 Our $47,930 Chevy Traverse Premier Redline is priced up there with Buick Enclaves and Infiniti QX60s, though the base Traverse starts at $30,875, and the popular Traverse LT with cloth seats begins at $35,495. 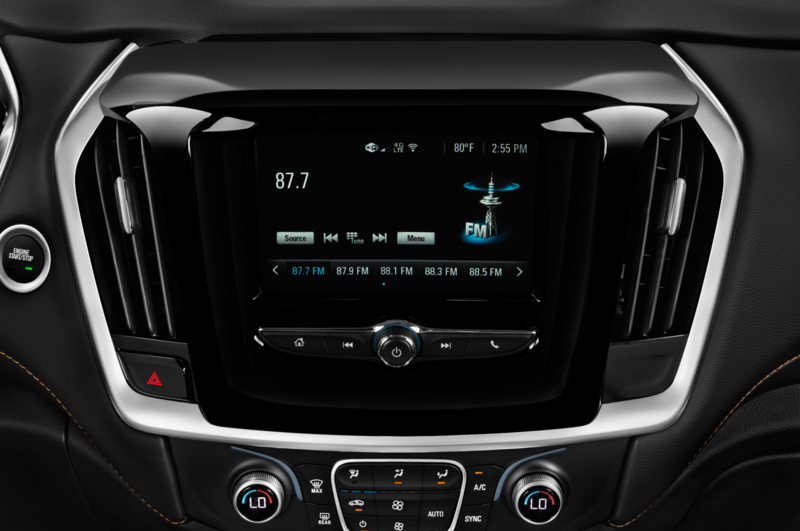 We enjoyed the Bose Premium 10-speaker hi-fi, standard with the Premium trim, listening to a mix of public radio and XM channel 67, but we didn’t bother with Apple CarPlay (what are we going to do – call each other?) 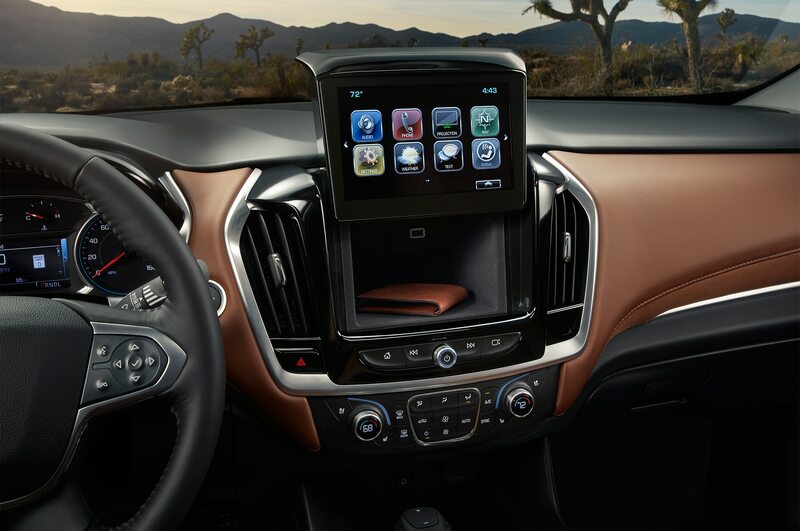 nor the OnStar or 4G LTE wi-fi hotspot. 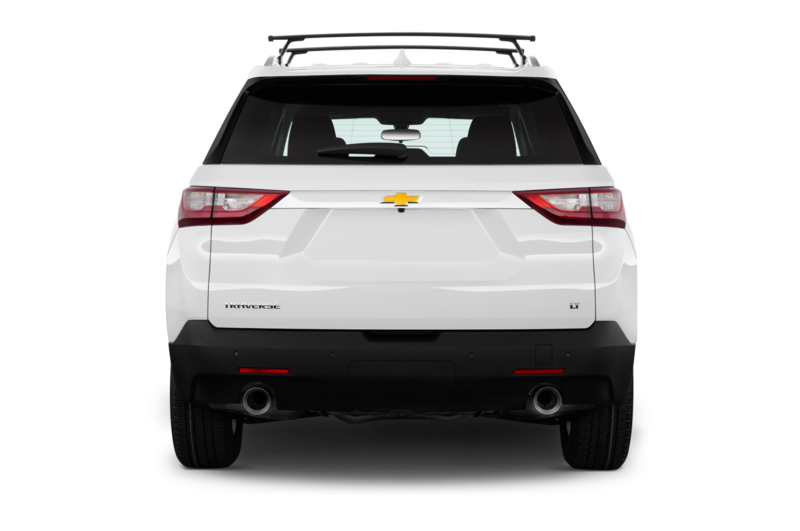 Longer trips, maybe. 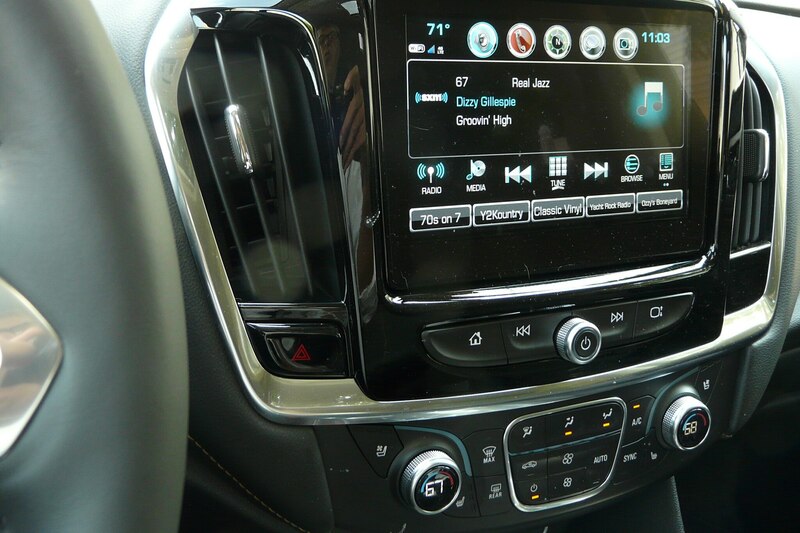 Everything operates by touchscreen, though. 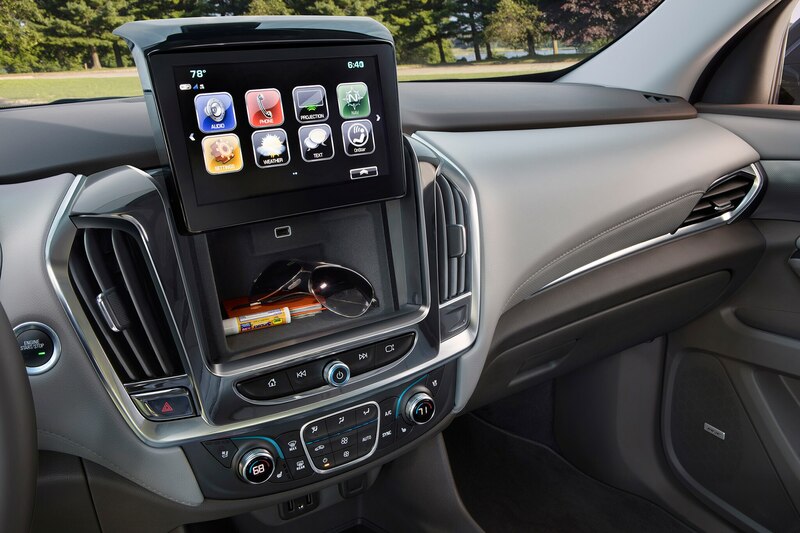 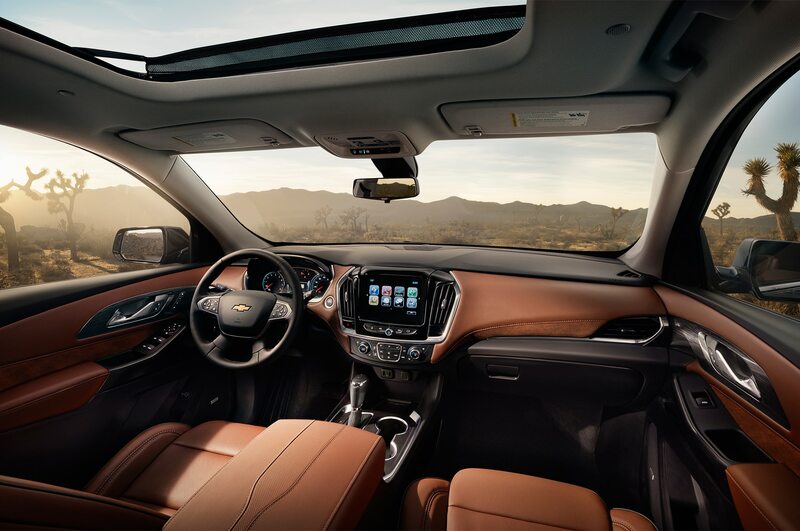 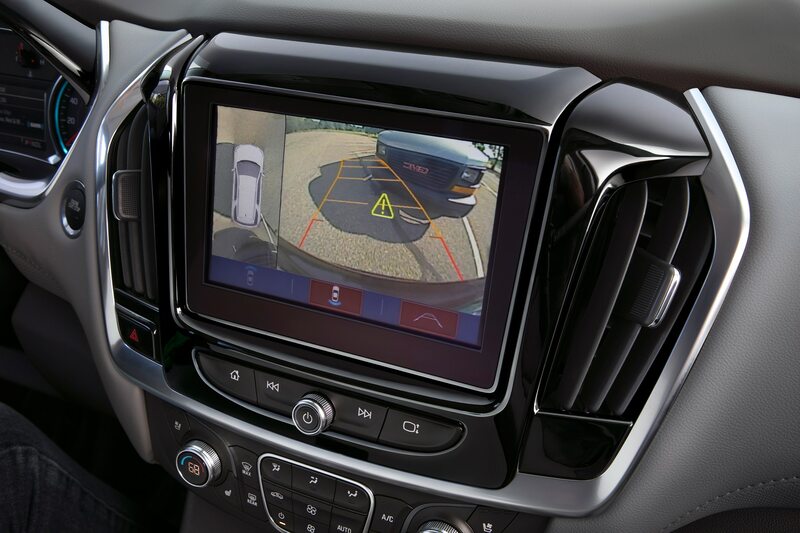 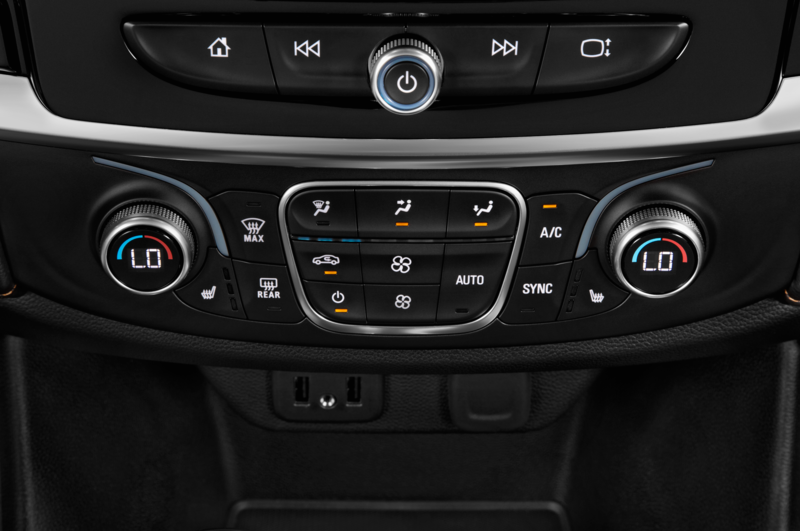 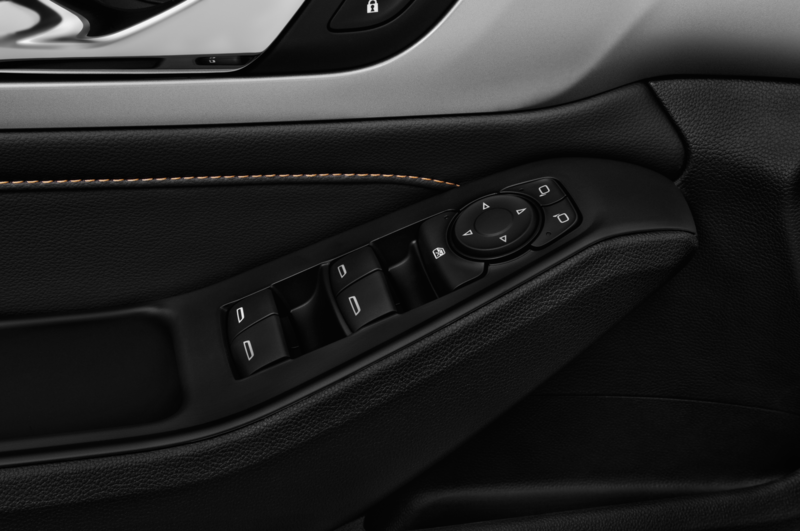 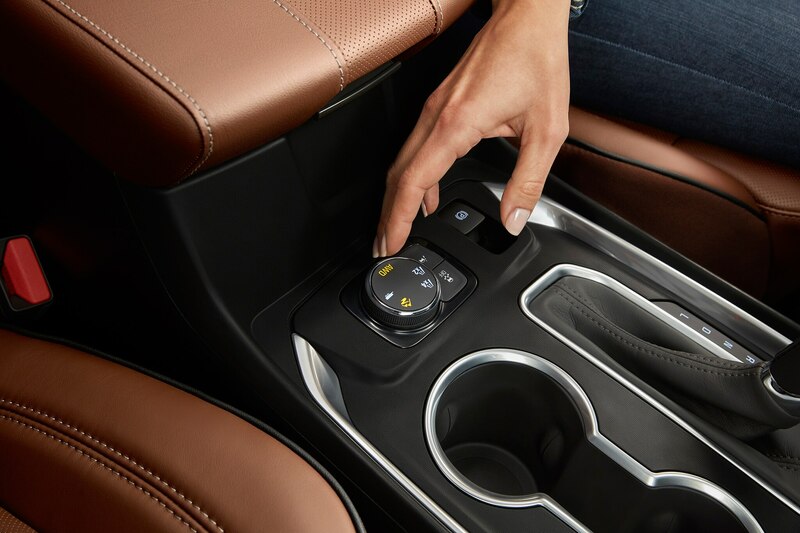 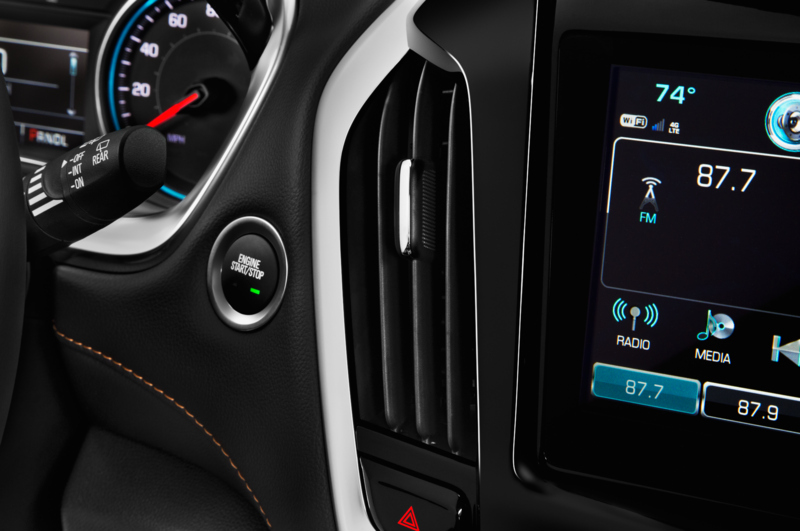 Chevrolet eschewed the tuning knob in the new Traverse, as well as the Equinox, which makes finding that out-of-town radio station too distracting. 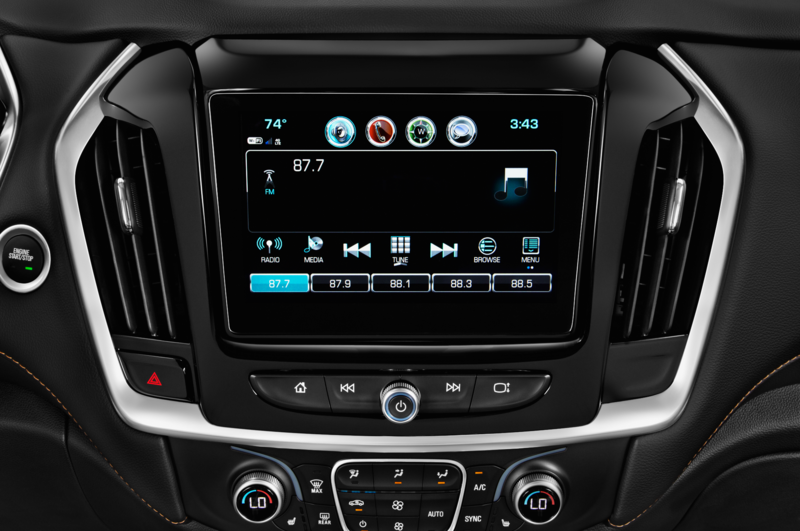 We did use the navigation system and its eight-inch color touchscreen on Saturday night to find a restaurant in Cadillac. 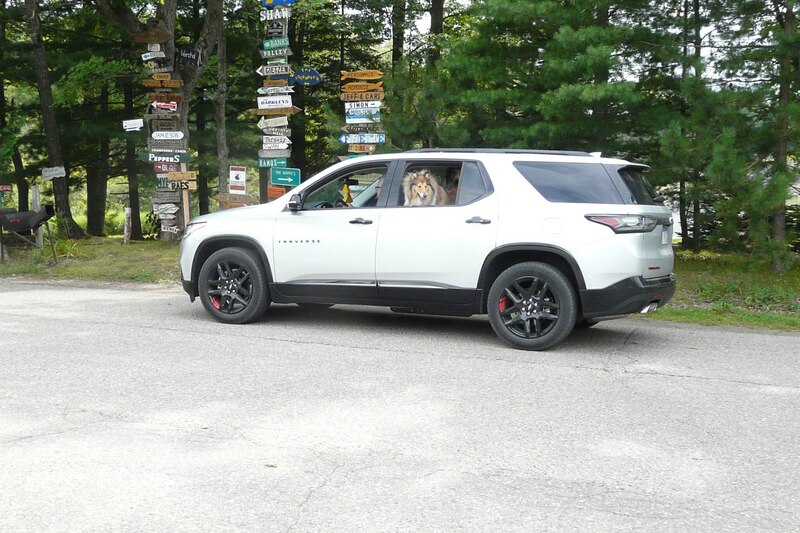 The navigation took us out of our way by maybe half a mile, through a closed-loop cul de sac in our lake area community, before directing us to the town about 35 miles away. 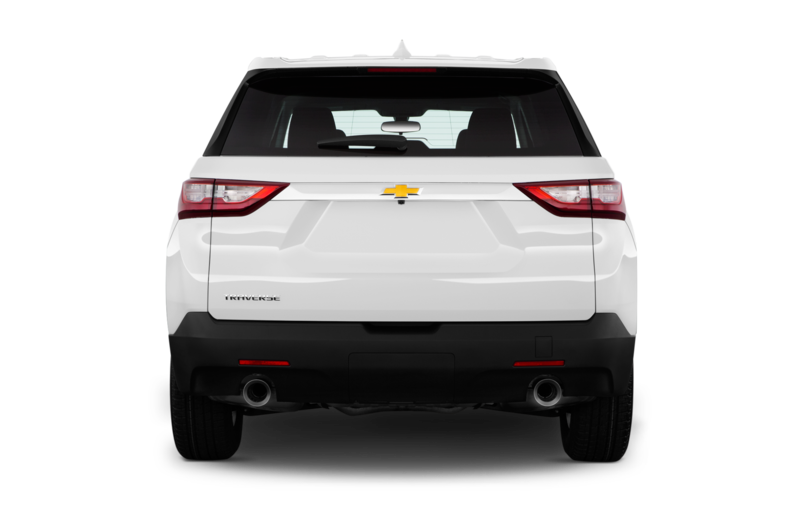 On Sunday morning, I drove to a dirt road near our cabin, where there’s some deep sand on parts of the mile-long stretch that goes unplowed during wintertime. 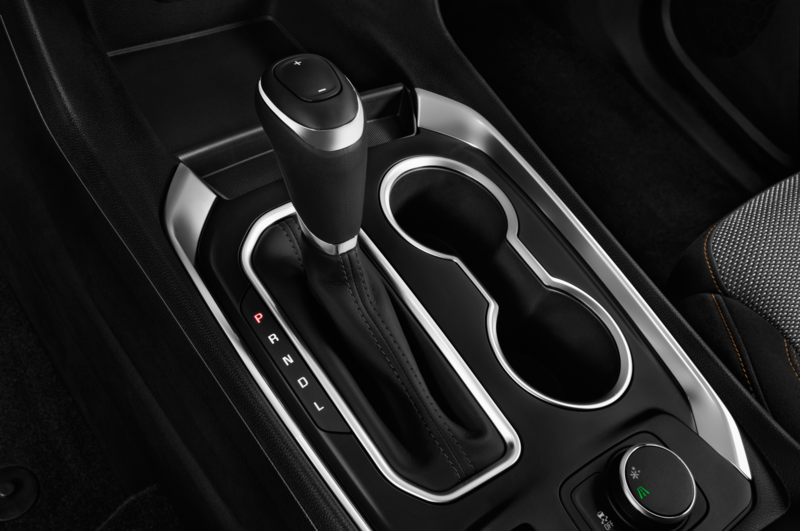 I could have had some fun with the twin-clutch Advanced AWD system that disconnects the propshaft for better fuel efficiency. 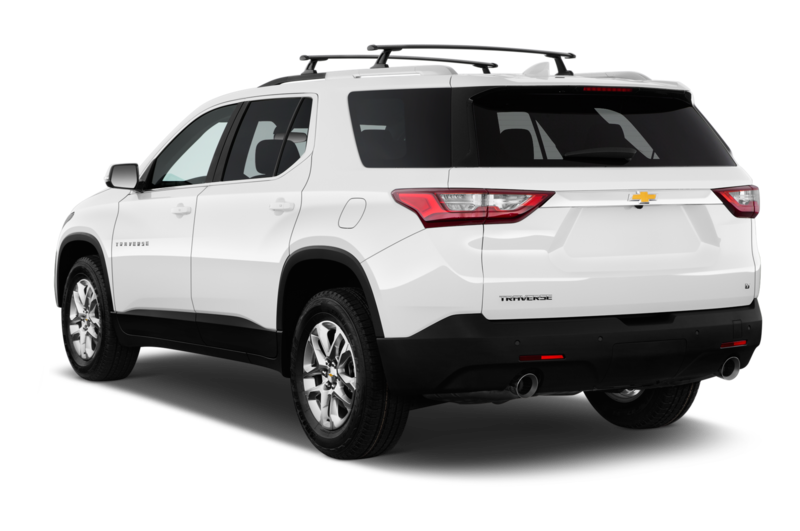 It’s standard on the new top-of-the-range $52,995-base Traverse High Country. 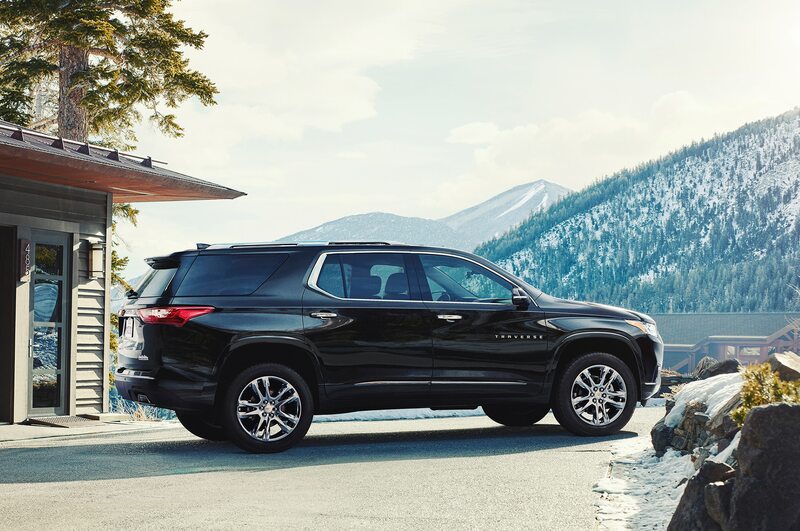 The High Country’s Advanced AWD has four driver-selectable modes (our FWD model came with three; standard, snow-mode and trailer, of which Traverse can tow up to 5,000 pounds). 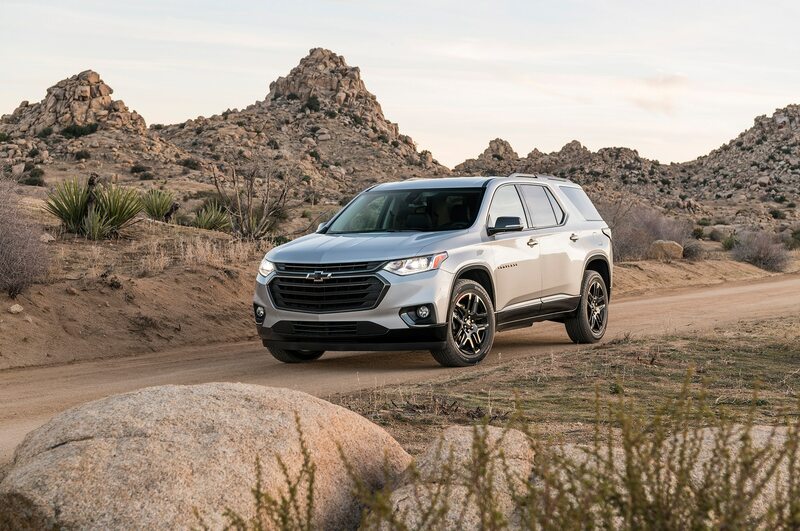 In AWD off-road mode, the system turns the Chevy Traverse High Country into something of a rally car around dirt-road corners, “like a WRX,” says chief engineer Perelli. 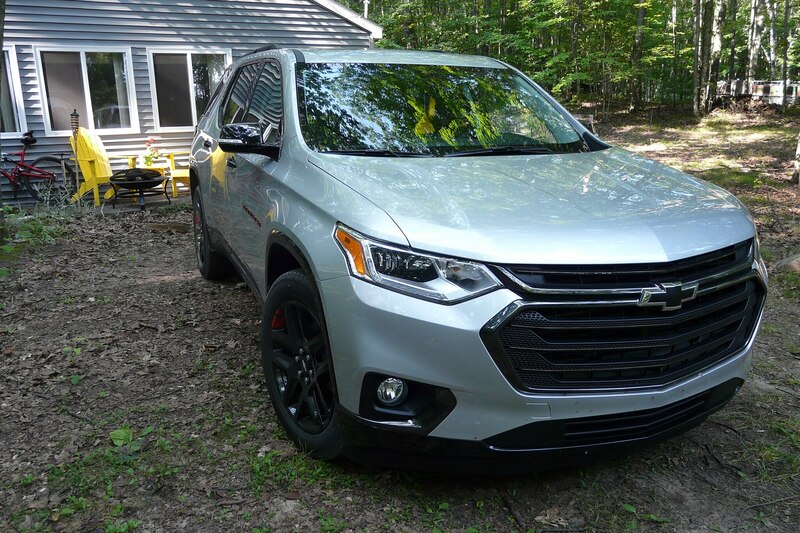 For me, with my FWD Premier Redline, the road made only a decent photo-op. 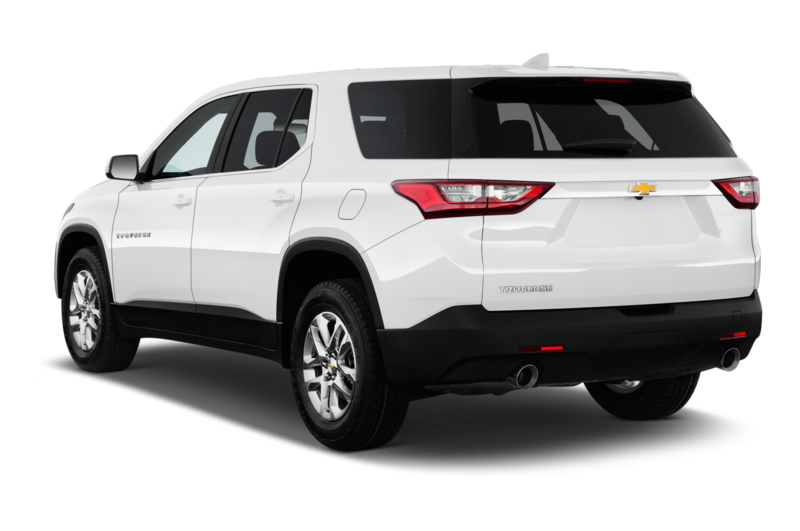 It acquitted itself well back in Metro Detroit Monday, when I subjected the SUV to my standard local cloverleaf of right-turn sweepers. 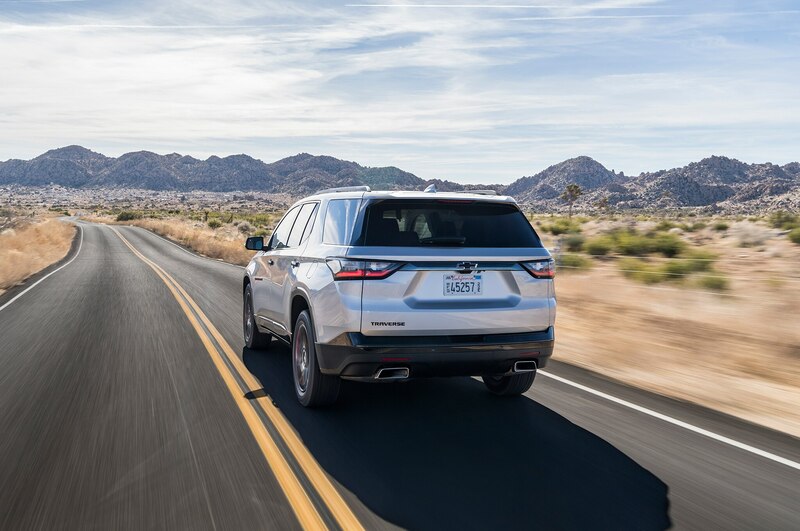 There’s no wallow to accompany the soft, comfortable ride, and the SUV steers through such turns with mild, predictable understeer and moderate yaw. 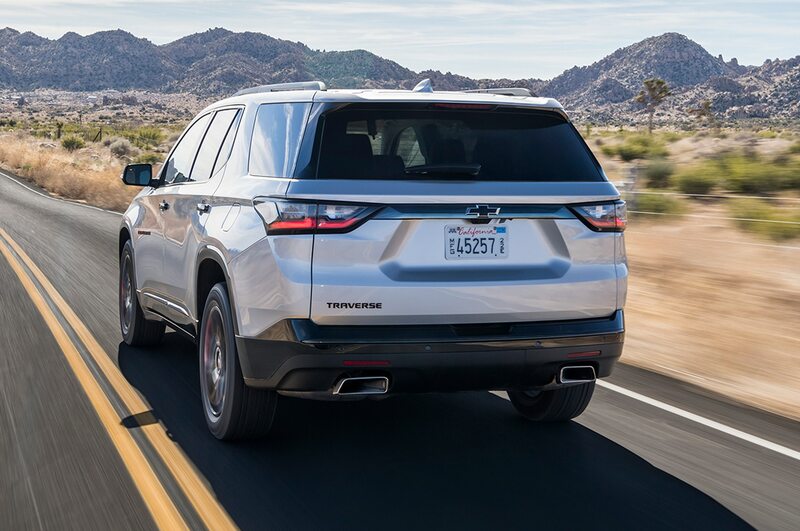 You can go sufficiently fast without alerting any stability control nannies, unlike, say the segment-leading Ford Explorer with its overly intrusive Curve Control. 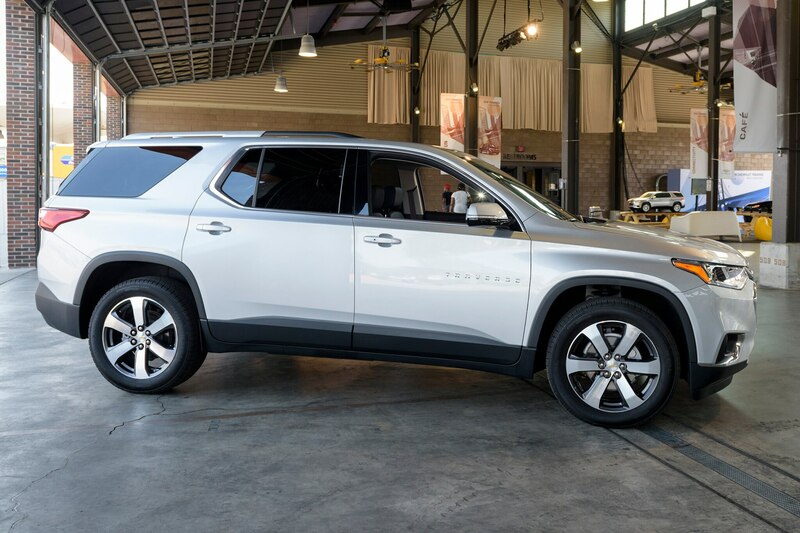 The Traverse’s steering initially required a bit of mid-curve correction. 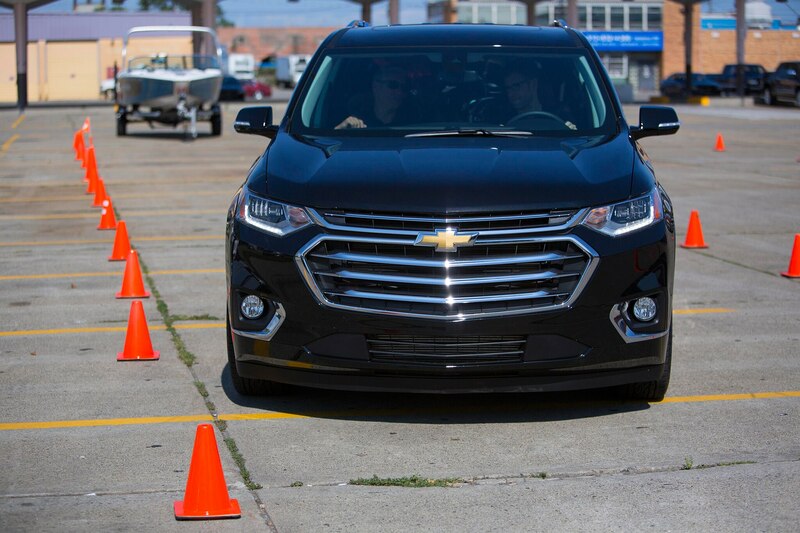 Even with 266 pound-feet going to the front wheels, there was no detectable torque-steer. 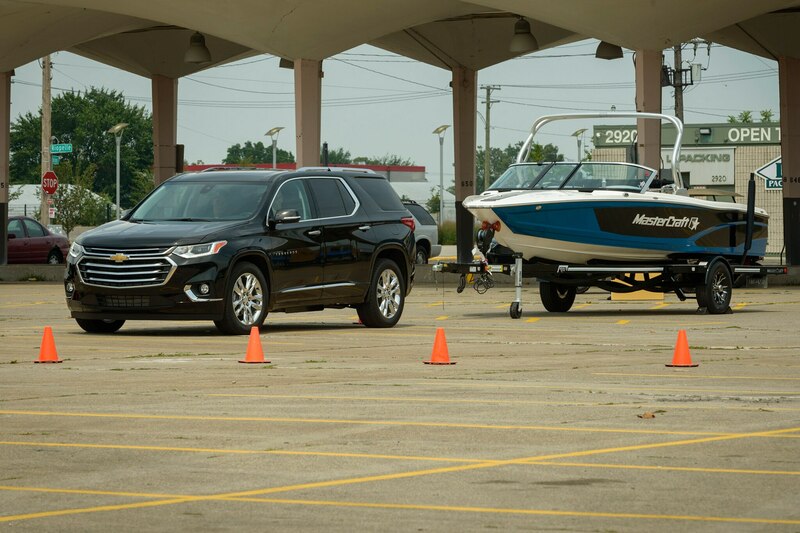 I heard and felt the un-defeatable stop/start start up just once, on the way back to the office from this modest handling exercise. 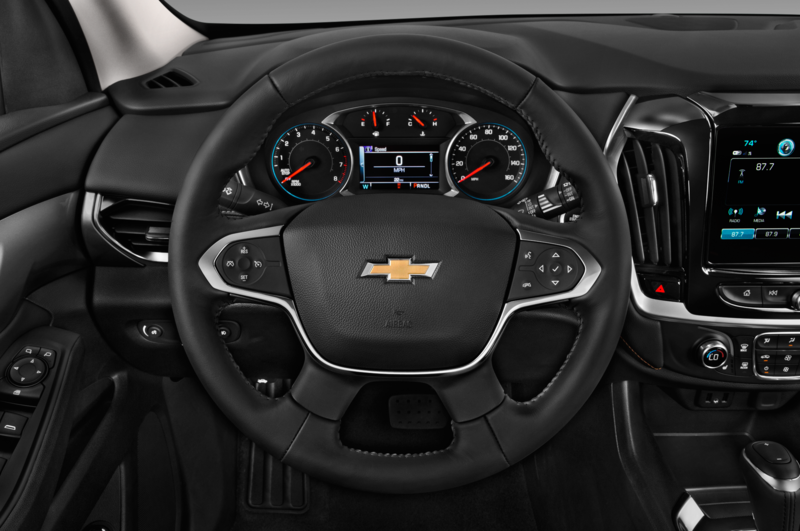 Otherwise, the fuel-saving feature was undetectable without an eye on the tachometer. 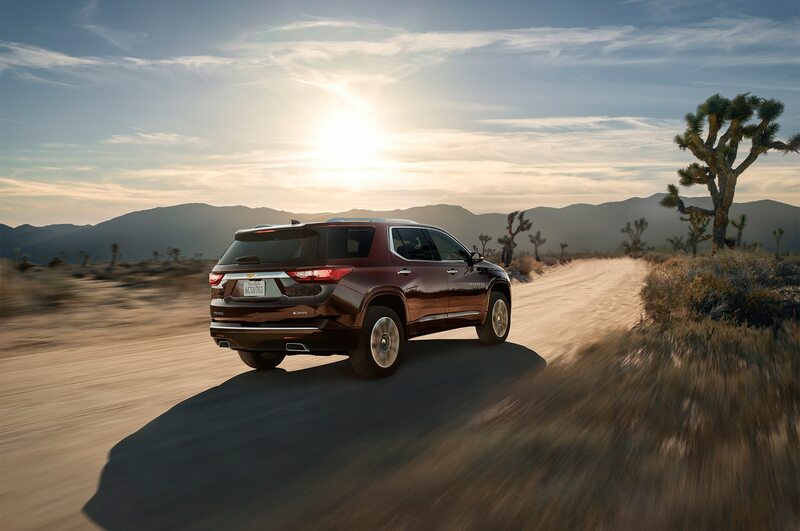 It’s the best stop/start in the business. 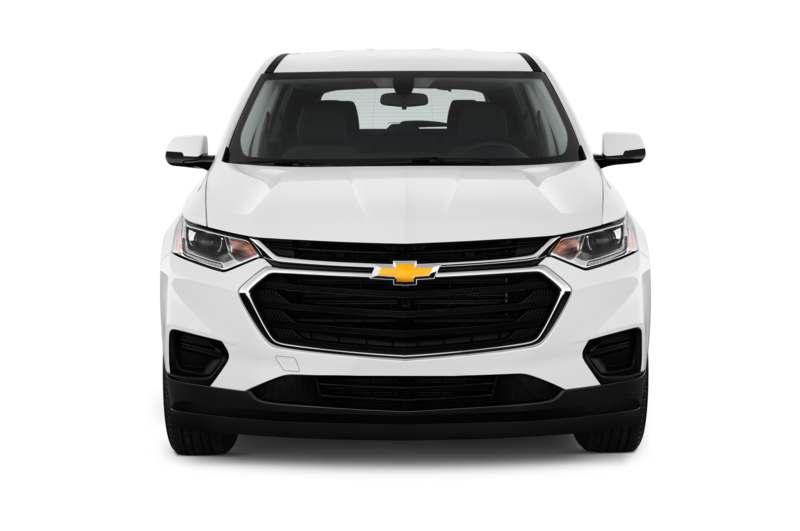 The three-hour drive back to Metro Detroit a day earlier was uneventful in a good way, even with traffic jams south on 127 and east on 96 as other weekenders tried to get home. 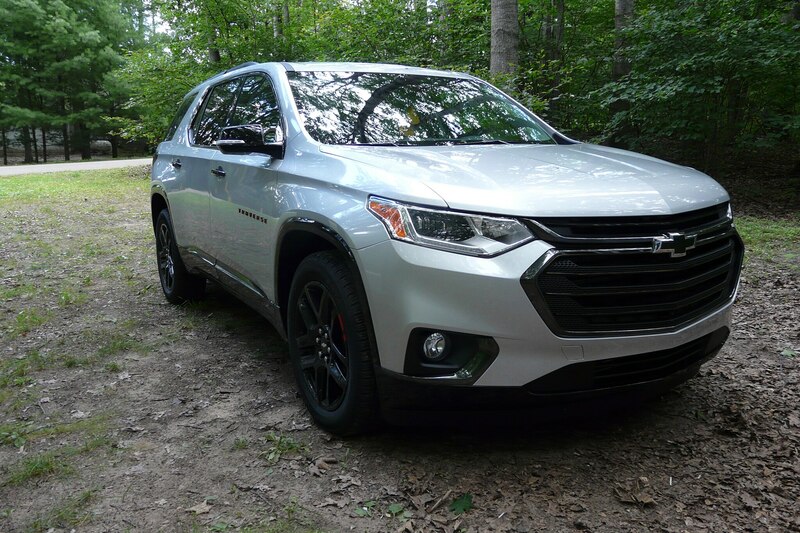 Yes, it’s a drive-and-forget sort of vehicle, with a plethora of entertainment options for three-hour-plus trips, with the best-looking styling in the segment. 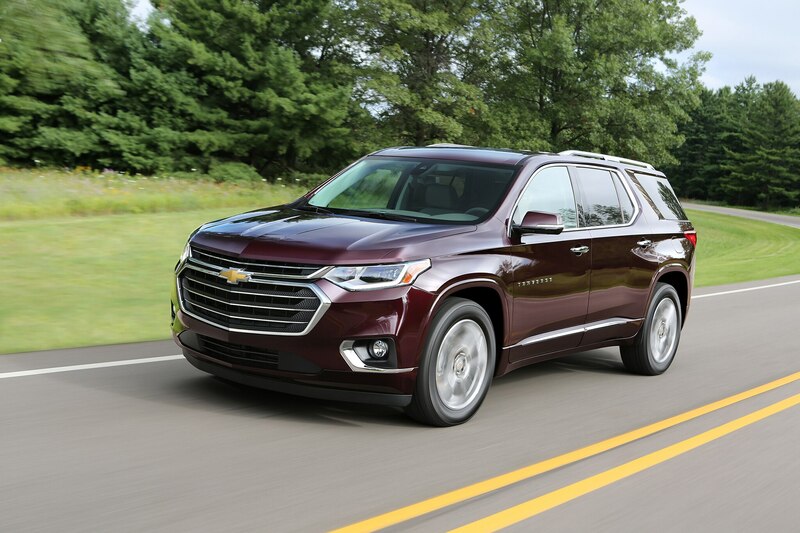 By Monday, I had driven the 2018 Chevrolet Traverse Premier Redline more than 600 miles, the last 256.7 off a fill-up in Cadillac. 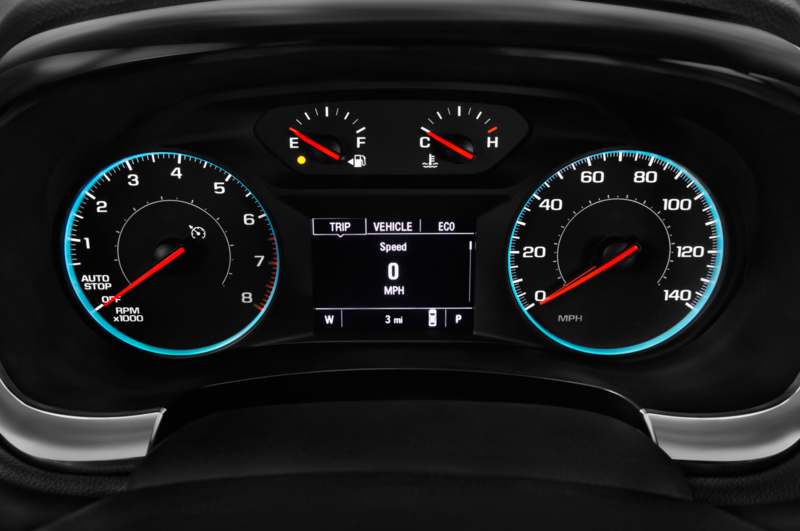 Indicated fuel mileage was 25.3 mpg at an average speed of 46.7 mph, but by my calculation (and with three or four extra clicks on the regular unleaded pump), I averaged 23.9 mpg. 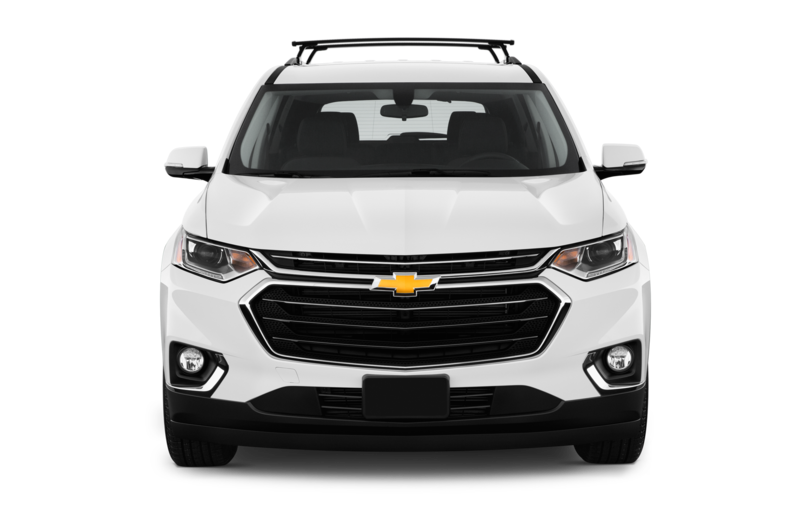 I returned the Traverse to Chevy with the weekend’s bugs and dirt washed off, and just about all of the fur vacuumed from the interior.